More Than Reunited, Blessed Beyond Measure! 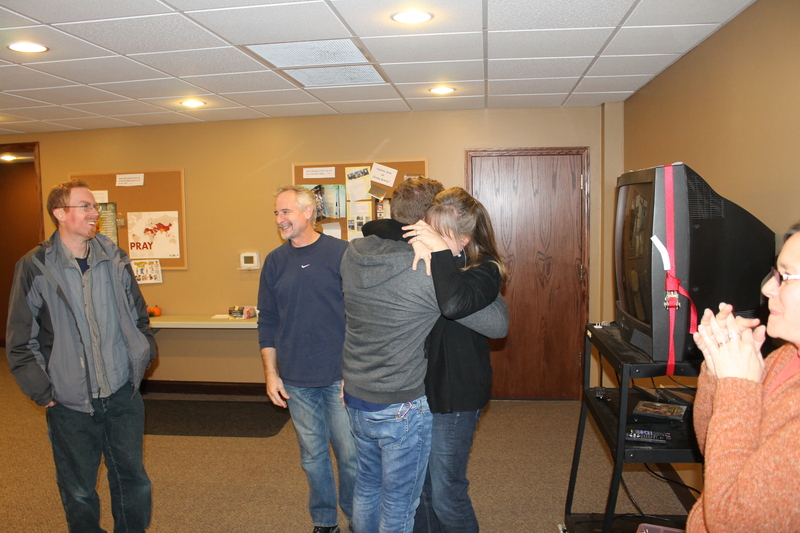 November 22, 2014 12:10 am / 1 Comment on More Than Reunited, Blessed Beyond Measure! What a surprise!!! God gave us a huge gift this week. He reunited our family. 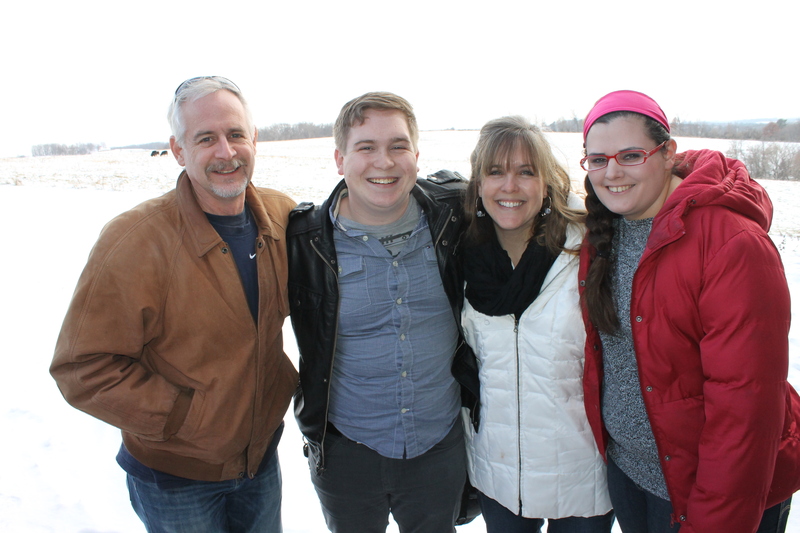 We knew we were going to get to see Garrett/Abby, Logan/Alex, and Tim’s parents this week, but we did not know we were going to get to see our oldest son Andrew. 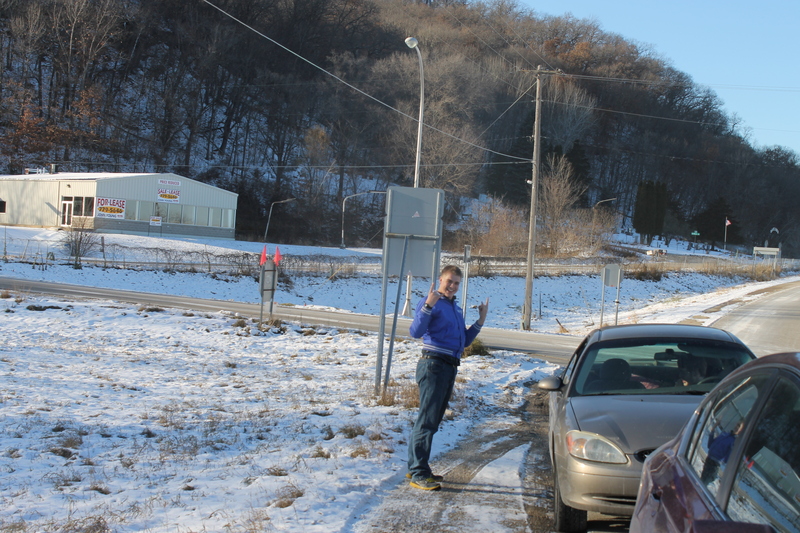 We arrived in the Viroqua area on Wednesday. We reunited with Garrett and Abby in the afternoon. 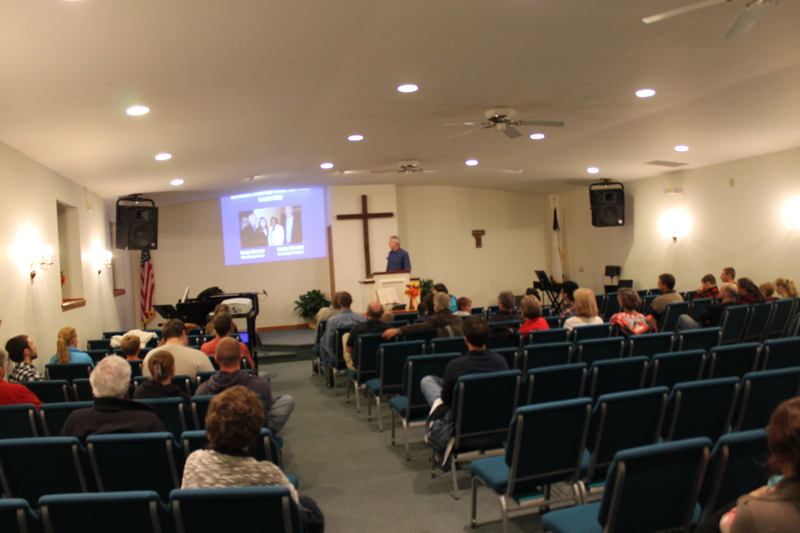 Then in the evening we spoke at our sending church, Grace Church in Viroqua, WI. 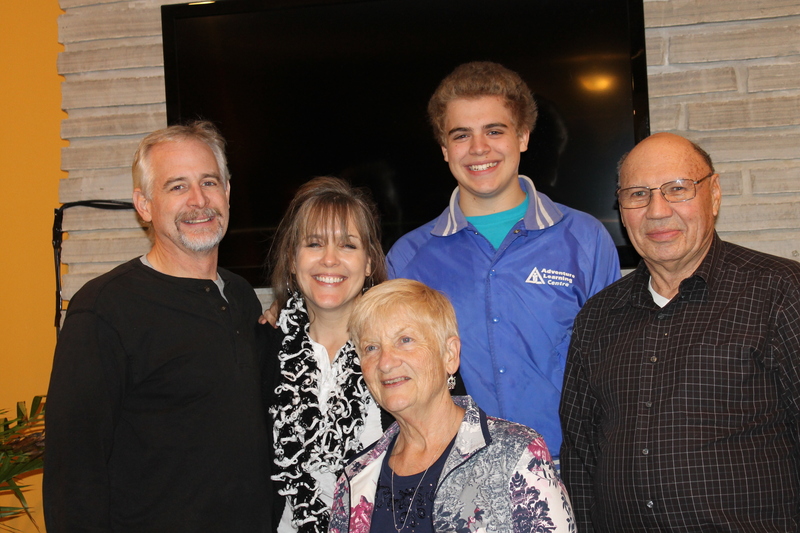 After the service, while we were fellowshiping in the basement, our oldest son Andrew, who we have not seen in almost a year, showed up. Neither Tim or I knew he was coming. (The pictures below tell the story.) 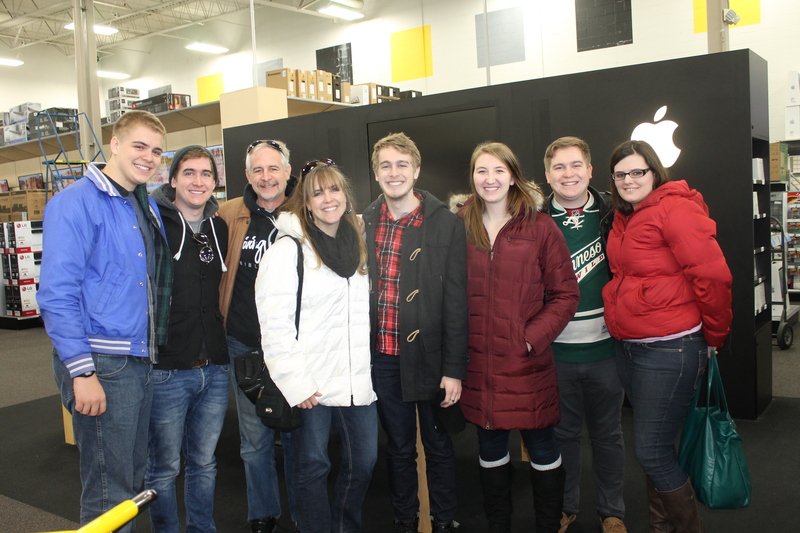 On Thursday we reunited with Logan when he met us at the LaCrosse, WI Best Buy. 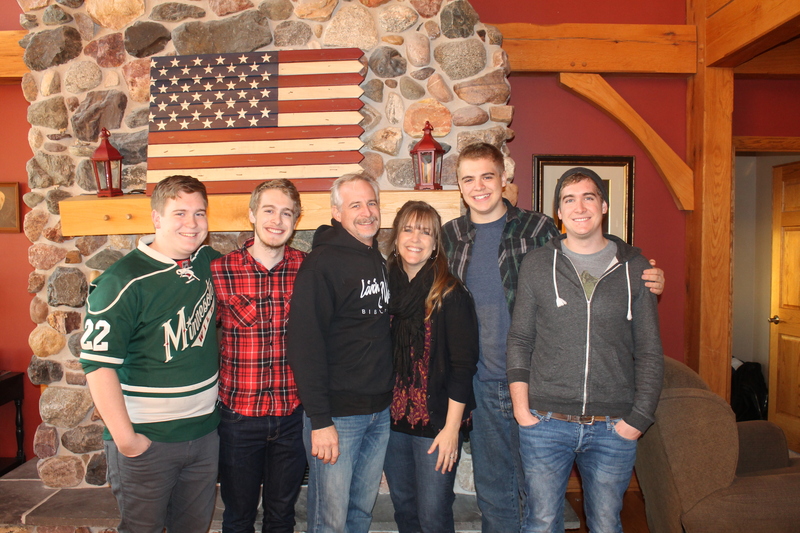 We were able to spend time with the boys, Tim’s parents, Abby, and Logan’s girlfriend Alex at the home of Brent and Tara Beck in Cashton, WI. 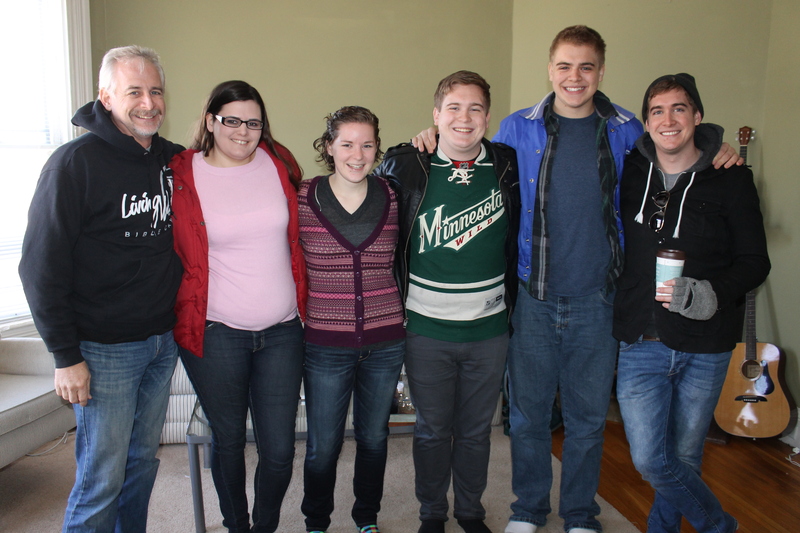 We arrived in Wisconsin content with the fact that we were going to be able to see Logan, Garrett, Abby, Alex, Tim’s folks and friends we had left nearly two years ago. God blessed us further by bringing us all together. God blesses us in unexpected ways and above and beyond what we could have imagined. 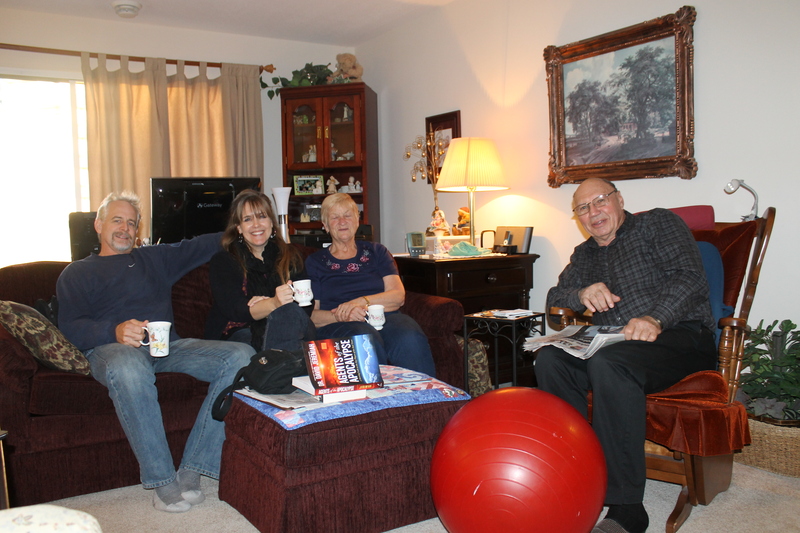 We had the aweseome privilege of spending a long weekend with our part-time Nassau parents, Bob and Faye Browning, in their London, Ontario home. We had a great visit. 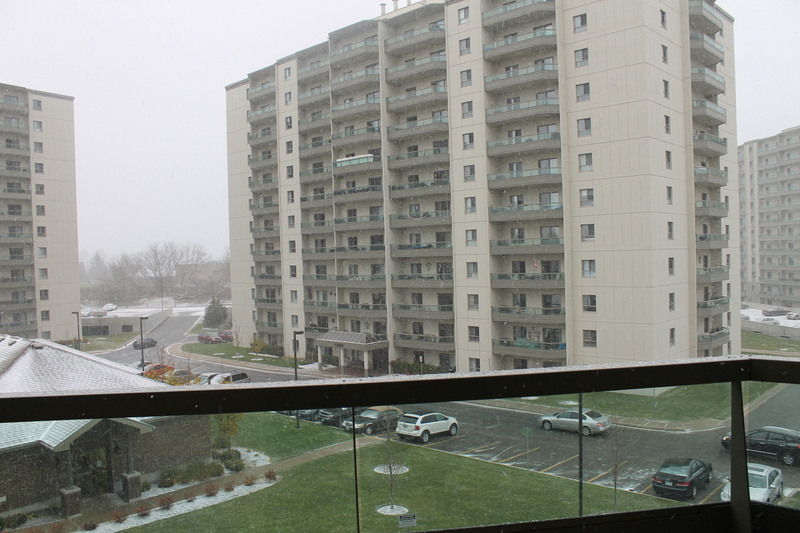 It lightly snowed the first day we were in London, Ontario. We were hoping to see some measurable snow while we were in the north. 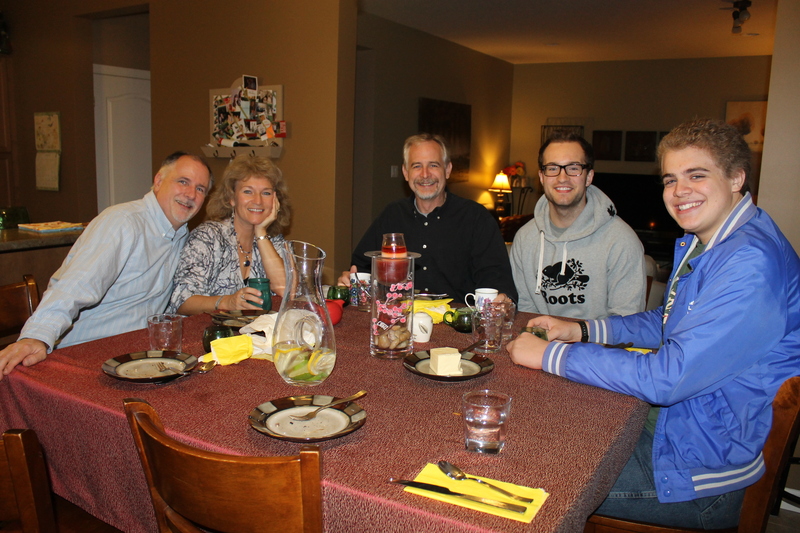 On Friday evening, we had dinner at Lyall and Julie Mix’s house. We met a couple of their children. 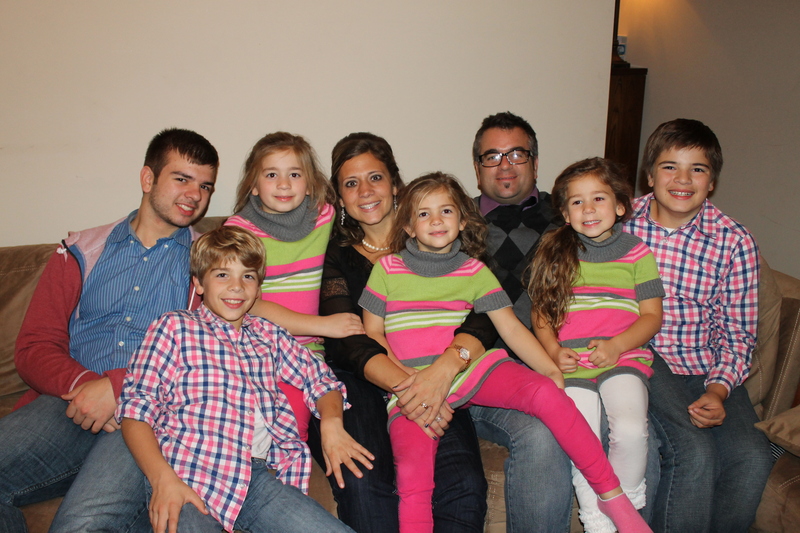 Lyall is assistant pastor at West London Alliance church. 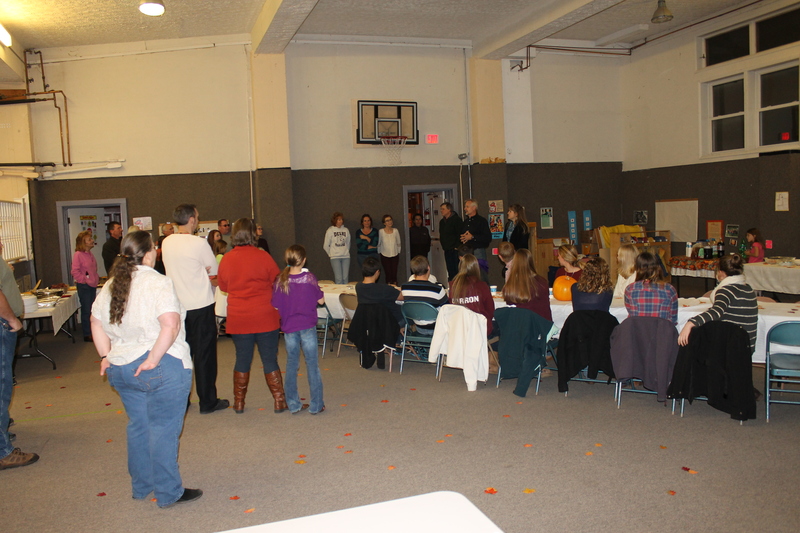 The dinner was planned so we could talk about the upcoming mission trip their church is taking to the Bahamas. 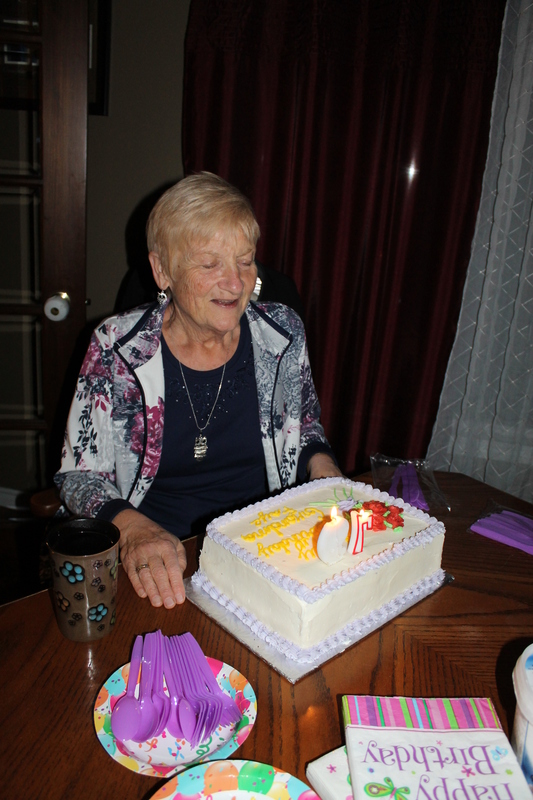 On Saturday we drove an hour away to meet up with Bob and Faye’s children to celebrate Faye’s birthday. 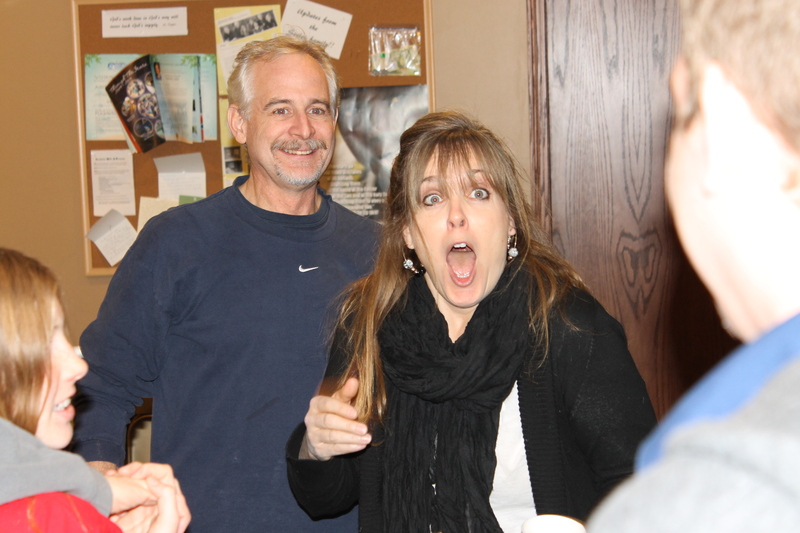 Bob planned the whole thing and managed to surprise Faye. 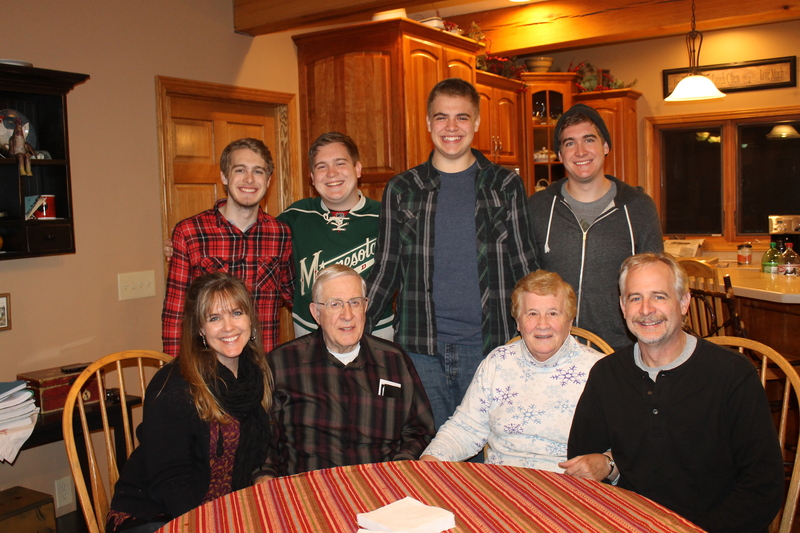 Bob and Faye with three of their sons, their wives, and a couple granddaughters. 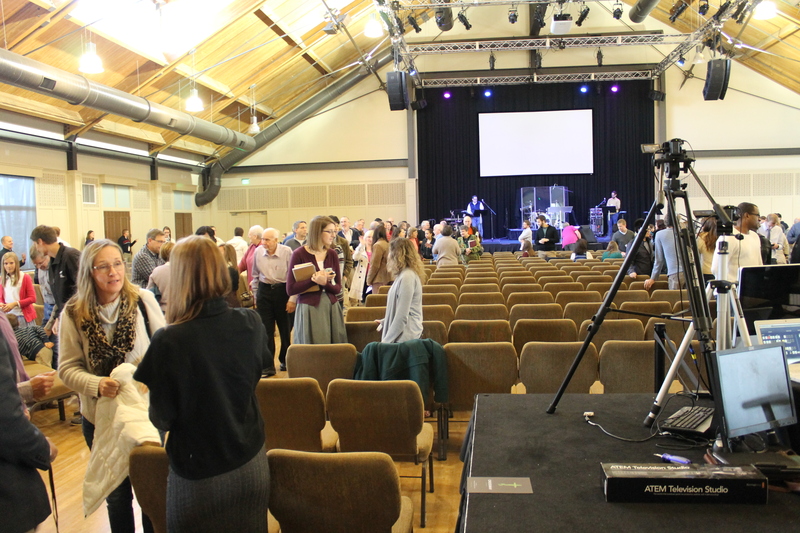 On Sunday morning we attended West London Alliance church. 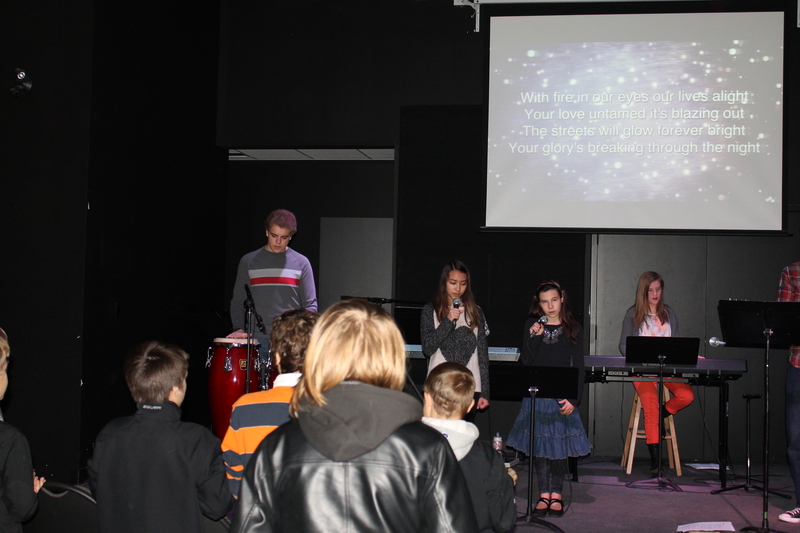 Zachary helped by playing in their youth worship band. 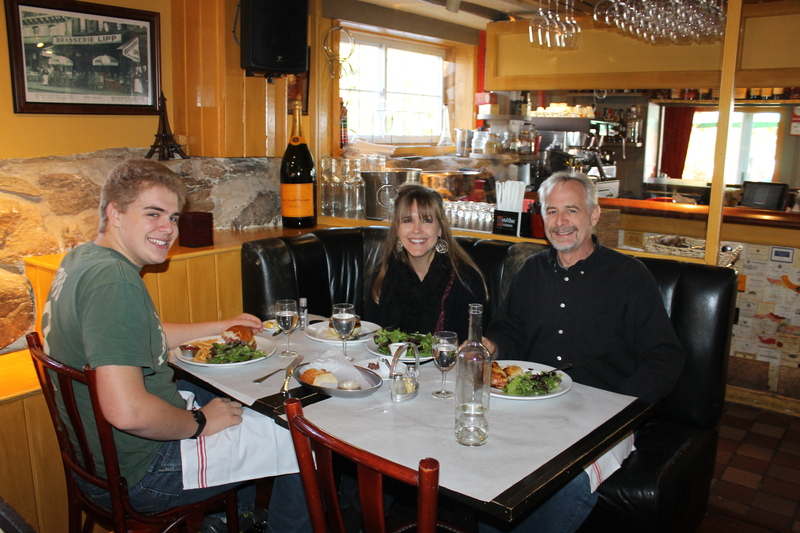 We had Sunday lunch with Lyall and Julie. Sunday evening we met with the West London Alliance Church mission team, shared particulars of our testimony and the Bahamas culture and ALC&C ministry, and answered questions. It was snowy as we left the London area to drive to Toronto. Bob and Faye drove us to Toronto to the hotel by the Toronto airport where we were to fly out the next day. We met up with Julian Williams Monday evening. Julian has been to Nassau to visit us. It was fun seeing him in Toronto. Tuesday we flew from Toronto to Chicago. 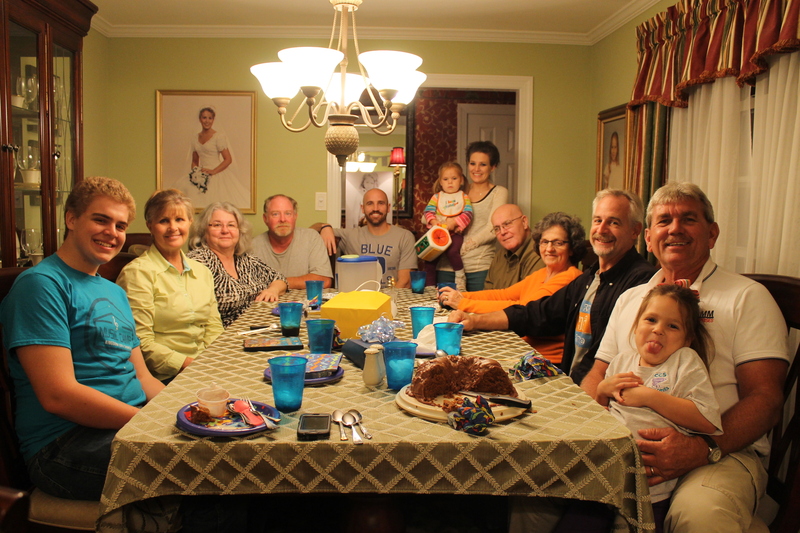 We had dinner at Lee and Stacie Burtelson’s house. 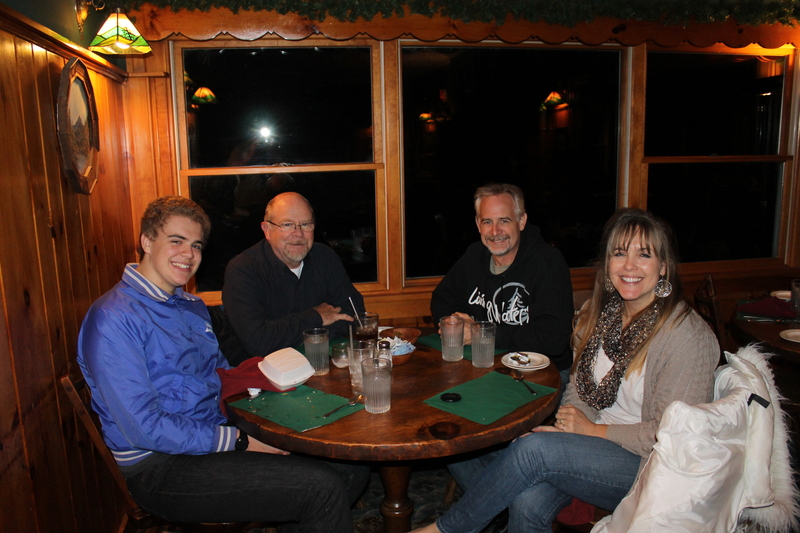 We met with another early ALC&C board member, Paul Hadley and his wife and daughter in law. 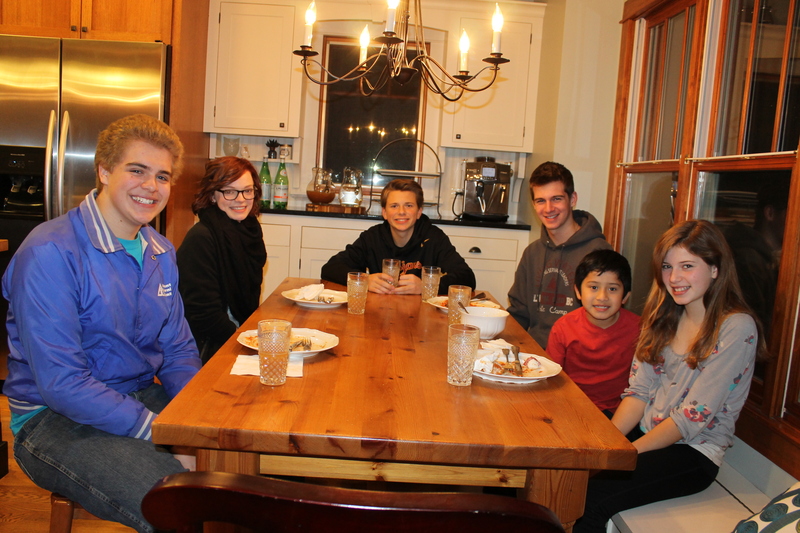 The kid’s table at the Burtelson’s. 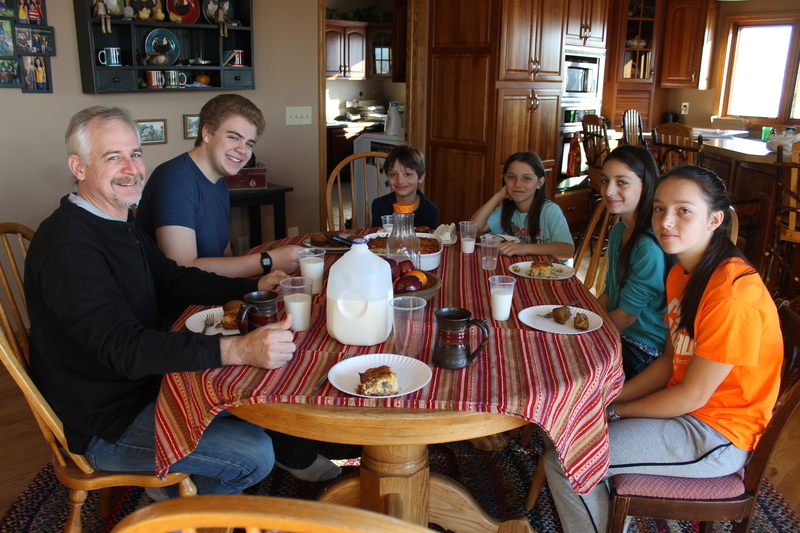 The following morning, we had breakfast with the Hadleys and the Jungs! 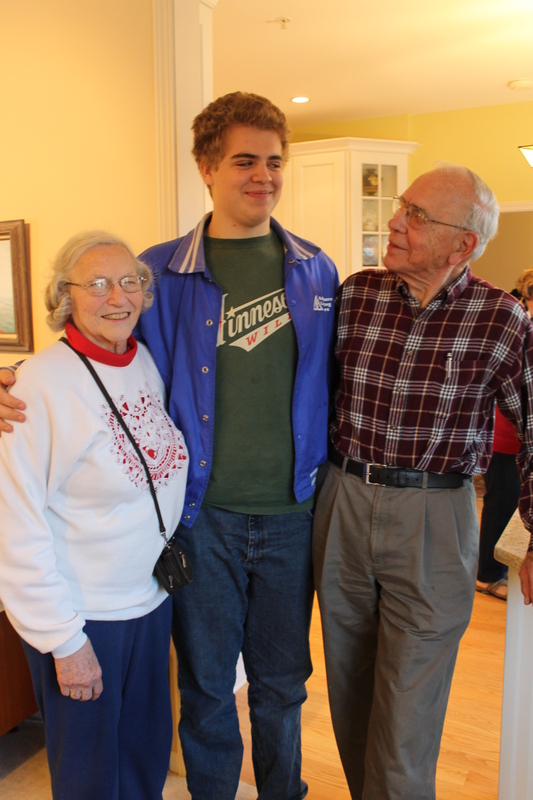 Erv and Marion look short next to Zachary (who doesnt?). Our first family reunion: Garrett and Abby. 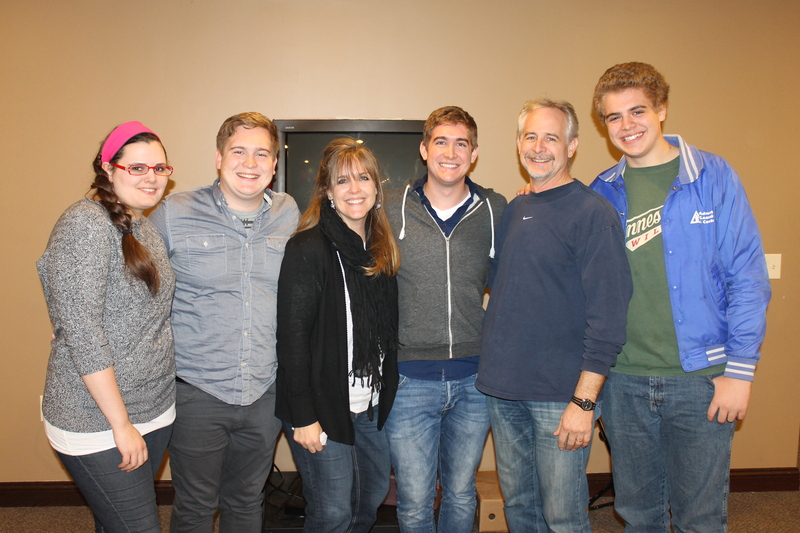 Time with our pastor and his family: Rich, Karen, Kellyn and Ethan Maurer. 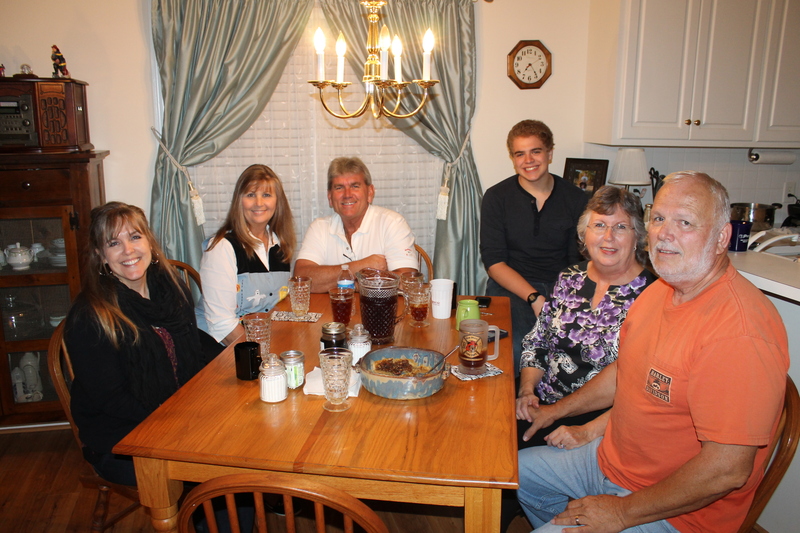 Time with the Eisermann family: Chris, Sheila, Chloe, Kinza and Jacob. Family reunion #2- Tim’s parents. 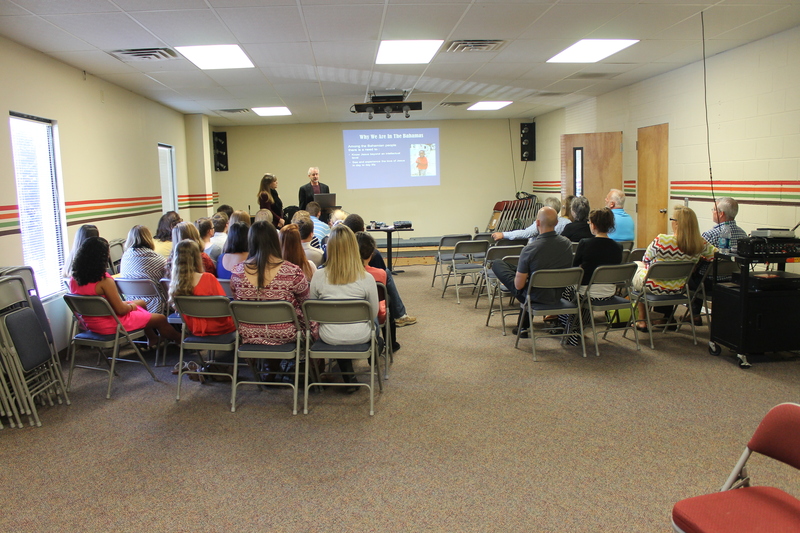 We provided an update of the ministry work with our sending church. I got to meet and hold the newest addition to the Jackson family. 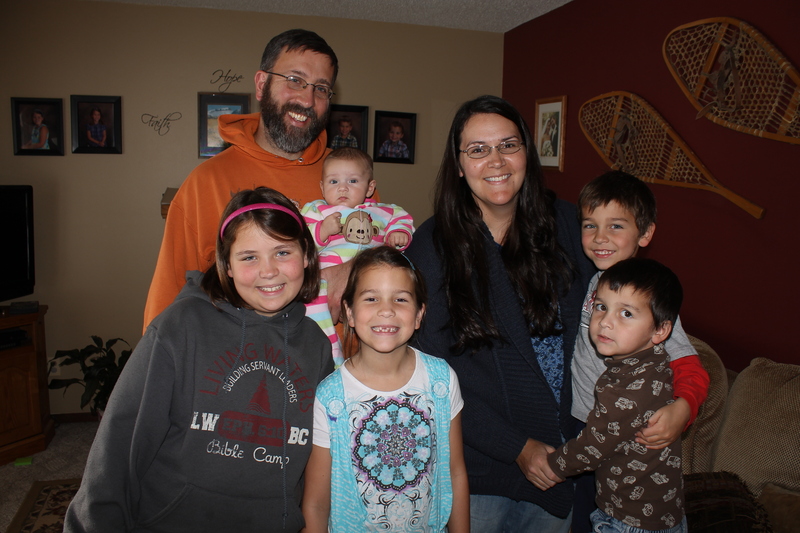 Melissa’s husband is the guest services manager at Living Waters Bible Camp. A total surprise! Andrew walked in and Tim noticed him first. Then I notciced him. Of course the other boys knew he was coming so, Zachary had the camera ready. 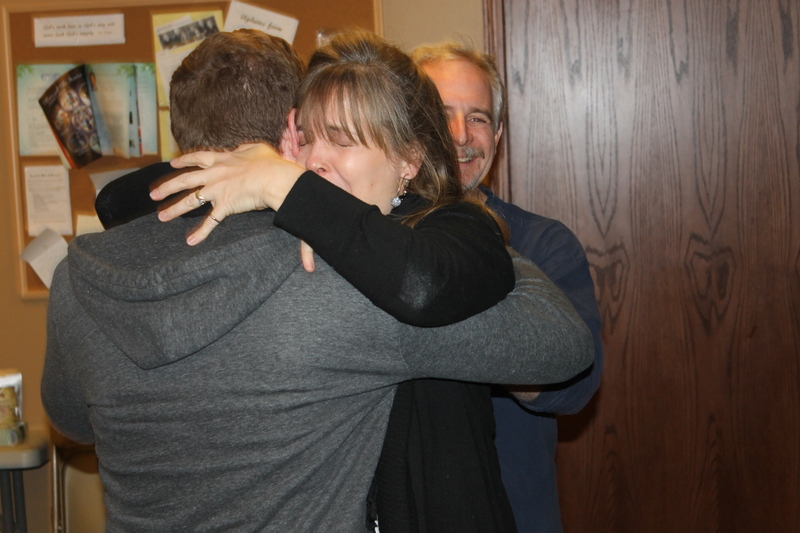 I was overwhelmed and of course so excited to see him. We hung out at the Becks for short while after church. 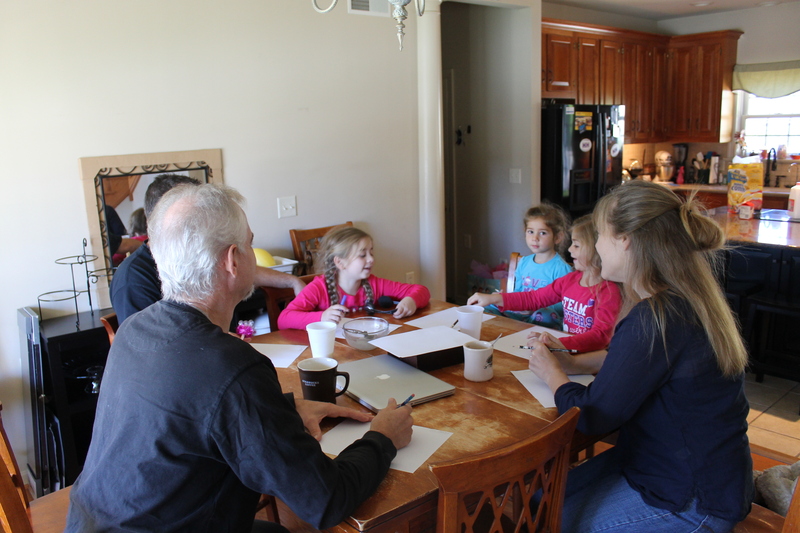 Thursday morning we were hosted by the Beck children. 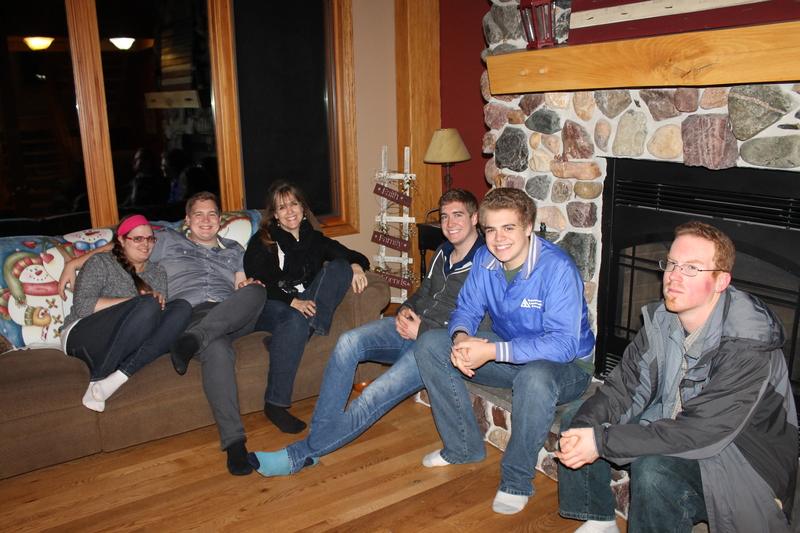 We love staying with this awesome family. A stop in at University Wisconsin LaCrosse to see Andrea Huser. 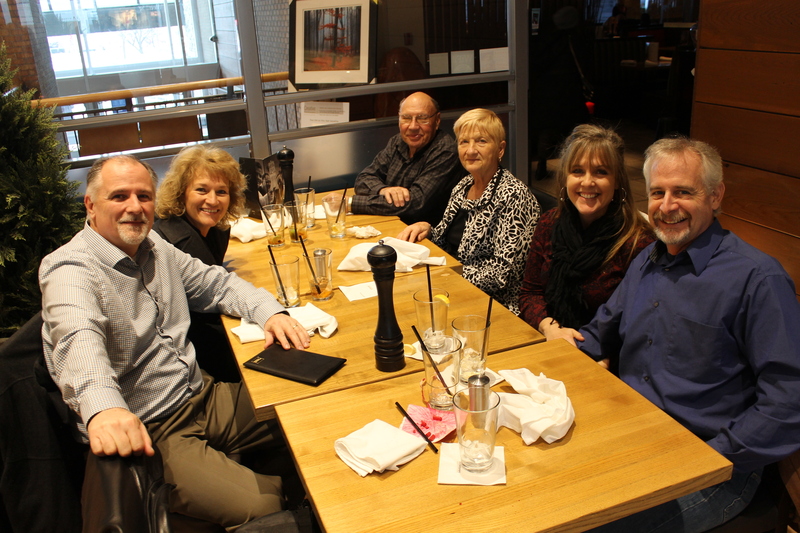 Followed by lunch with Dan and Nelva Melcher and Mom and Dad Seeley. 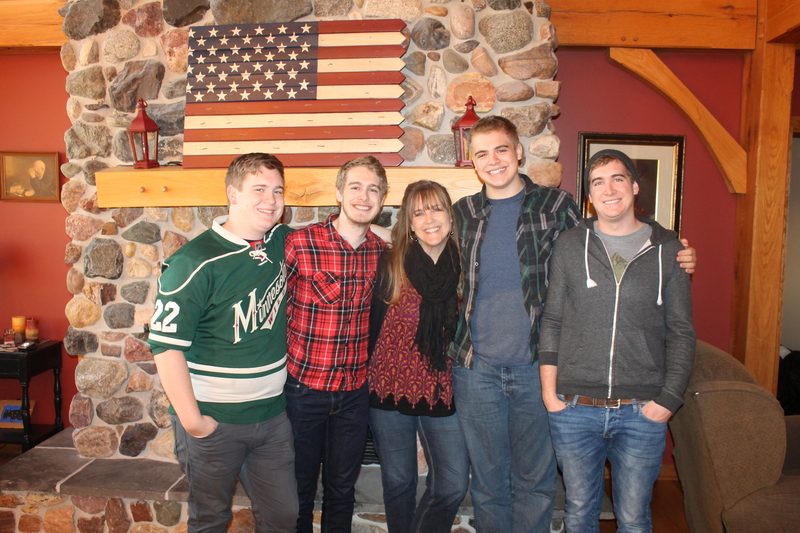 Zachary wanted to step foot in Minnesota, so since we were less than 5 miles from the Wisconsin/Minnesota border, we drove in just long enough for Zachary to be able to say he has never gone a whole year without being in Minnesota. 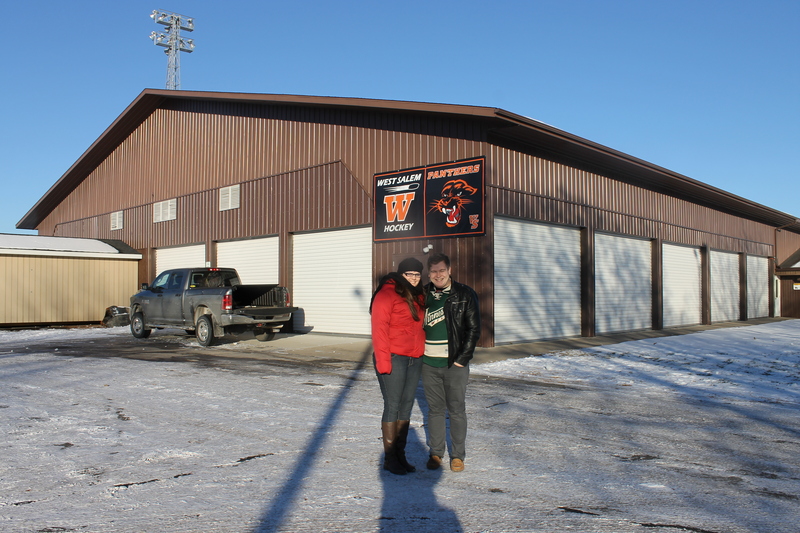 This is an indoor hockey arena now, but on June 6th, this pavilion will be the site where these 2 exchange wedding vows. 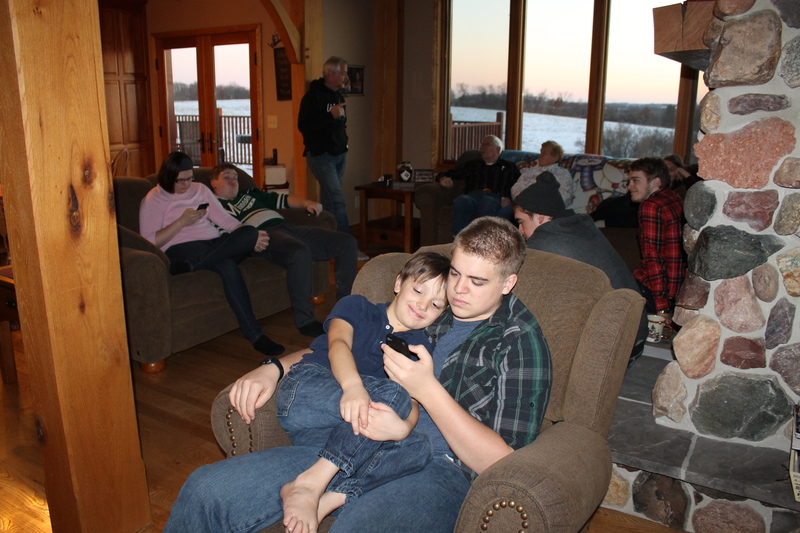 We loved having all the boys with us for a family picture. 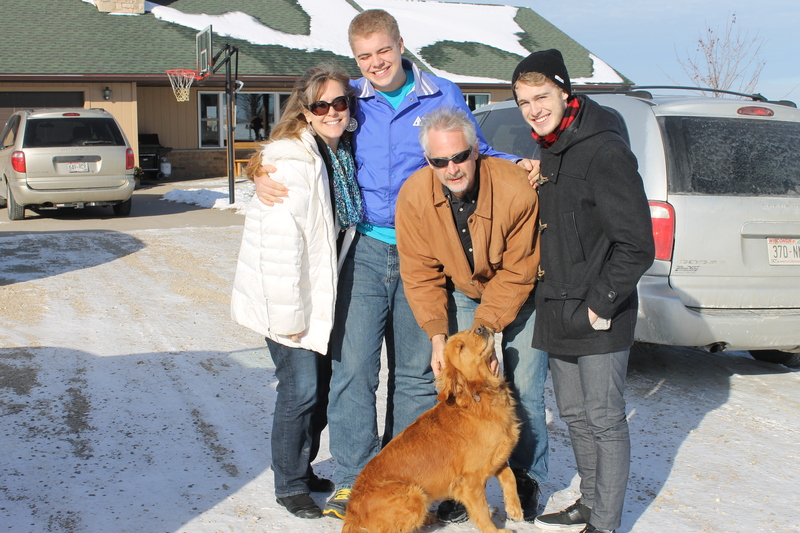 Our joy was hampered only by the fact that Katie could not be with us. That afternoon we hung out at the Beck’s house. 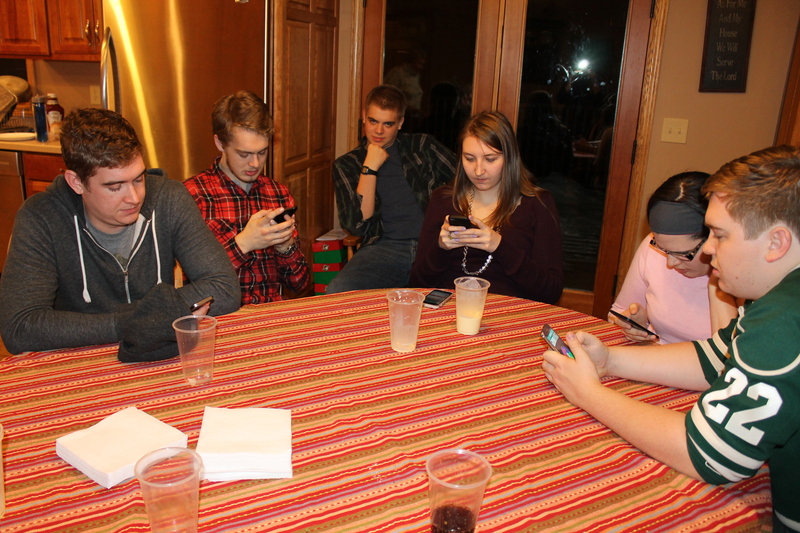 The kids were all on their phones playing a game together. At least it was a “together” game. I just enjoyed sitting and watching all of them. 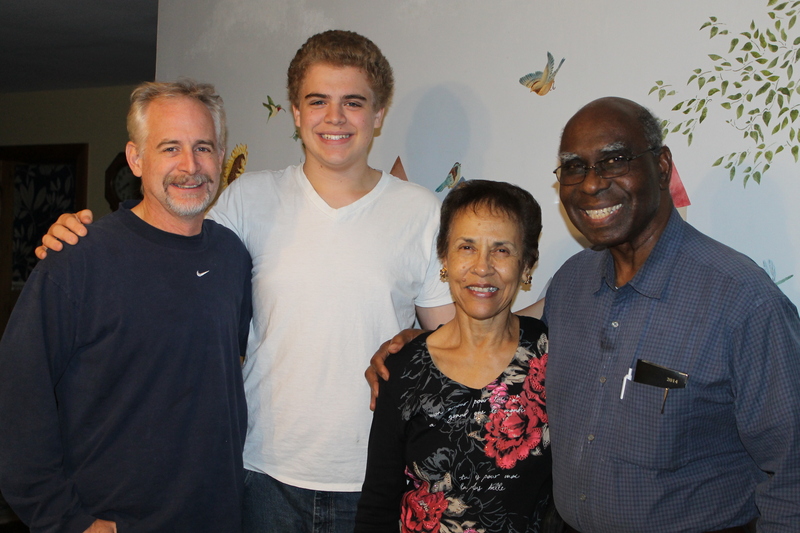 Family picture with Grandma and Grandpa. 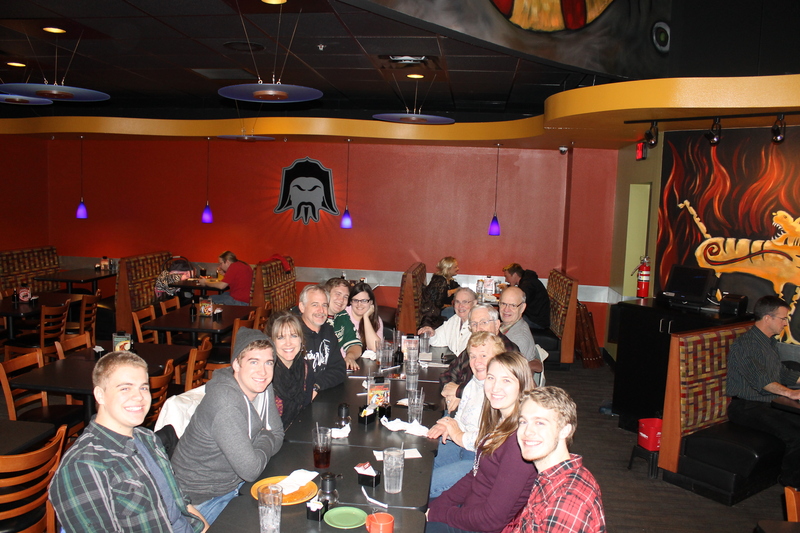 Sharing our last meal with the Becks before going our separate ways on Friday afternoon. We made a quick stop to see our dog, Bella! She acted like she knew us. We also stopped in to say good-bye to the Jacksons. 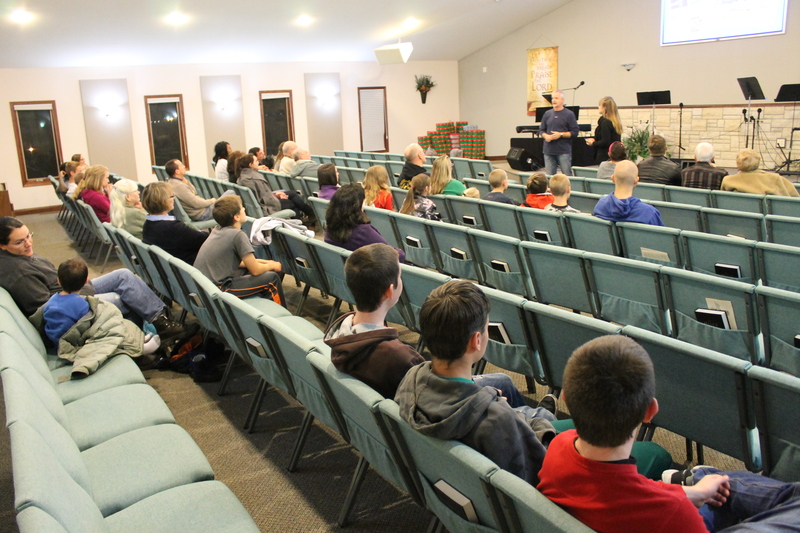 Friday evening we went to Grace Evangelical Free Church in Davenport, Iowa to meet with a prospective mission team for next summer. After the meeting, Zach played some fuse ball. It has been another tiring, but rewarding week. We are starting to look forward to the normalcy of being home in the Bahamas again in a little over a week. 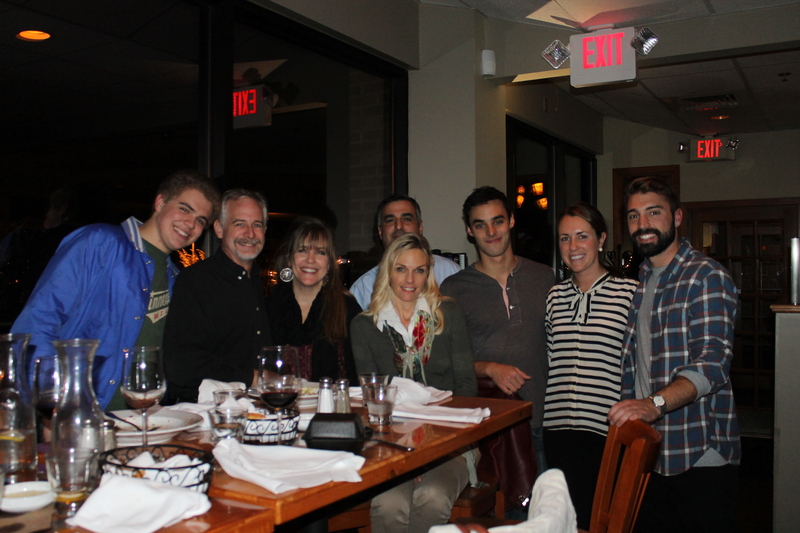 In the mean time, we are looking forward to seeing family in Indiana over the next week. Until the next post, have a great week! We are running a marathon, not a sprint! November 14, 2014 11:35 am / 1 Comment on We are running a marathon, not a sprint! Cummings GA, White GA, Franklin TN, Nashville TN, Canton GA, Wilson NC, Paseco NY, Delhi NY, Bethel CT, Huntington NY, New York City, Lancaster PA, Toledo OH, Windsor Ontario, Owasso MI, London Ontario. The last four are from this week alone. We are tired, but God is good and sustaining us. We have made a lot of great contacts, and we look forward to seeing what God does with our connections from this trip. It has been our goal to update our blog weekly while on this trip so people know where we are and what we have been doing, but we were unable to get a post done last Friday. Below is the update for the last two weeks. Enjoy seeing where we have been, who we have seen, and what we have been doing. It has been a great journey, and we have been incredibly blessed and encouraged by the many people we have met and visited. 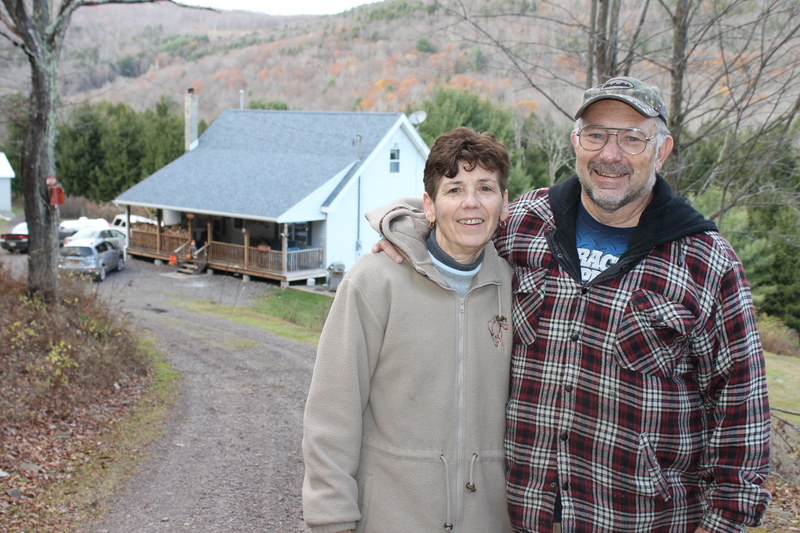 We were blessed to be guests in the mountain home of Walt and Marge Hutter in Andes, NY. We stayed with them until we left for Connecticut on Tuesday. 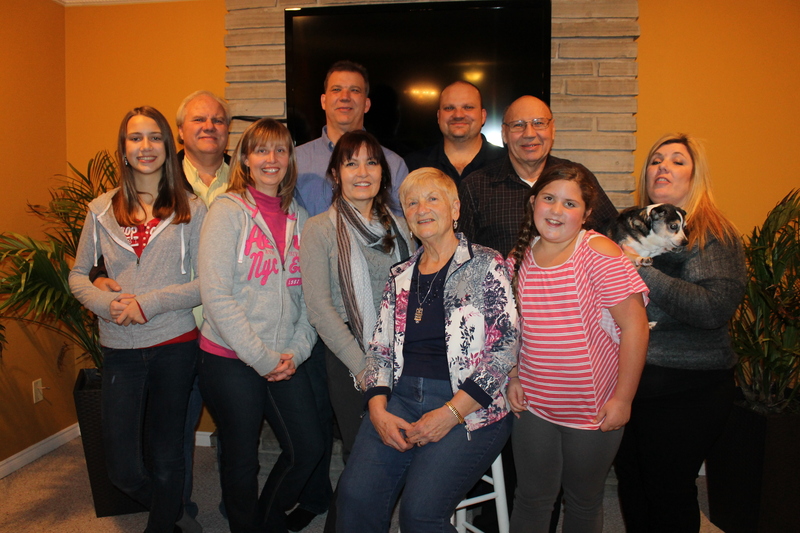 Delhi Alliance Church hosted a Bahamas Mission Team reunion on Saturday evening. 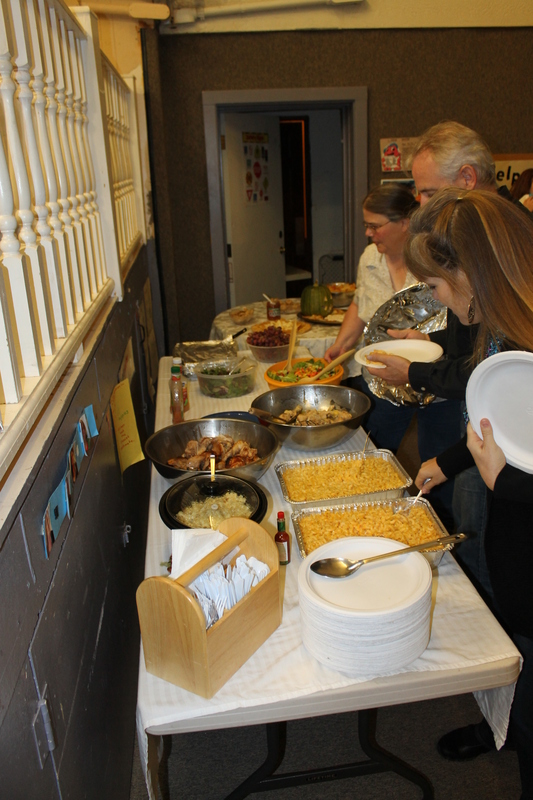 Jackie Howard (mother to one of our current ALC facilitators, Sam Howard) surprised us with a Bahamian meal. Yum! 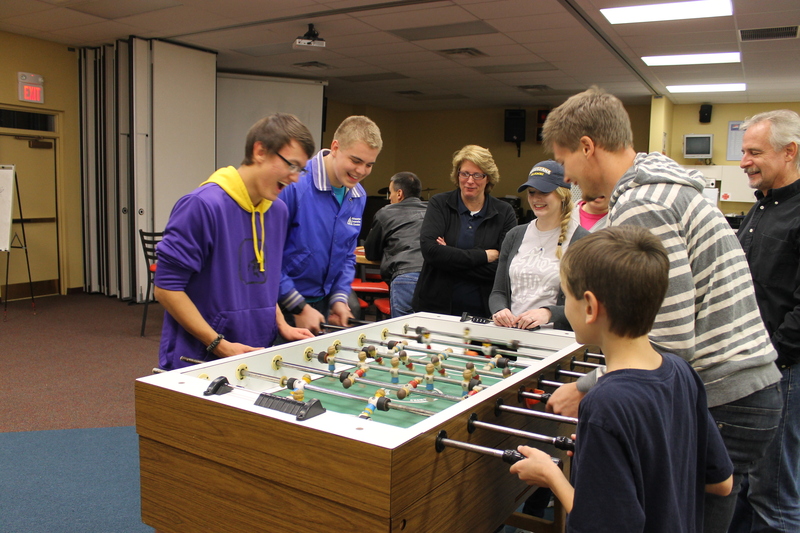 Zachary had a good time reuniting with the young people from the team. It was great seeing many of the Delhi team in person, but it was also good to “see” the ones from the team that joined us via Facetime. On Sunday morning on the way to Delhi Alliance Church, we were greeted with a dusting of snow. Snow is beautiful when you know you do not have to live in it for months on end. 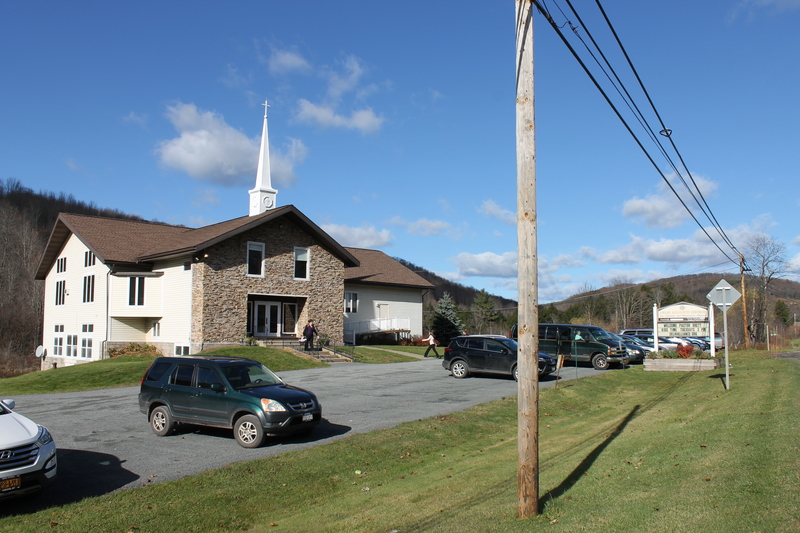 Delhi Alliance Church in Delhi, NY. 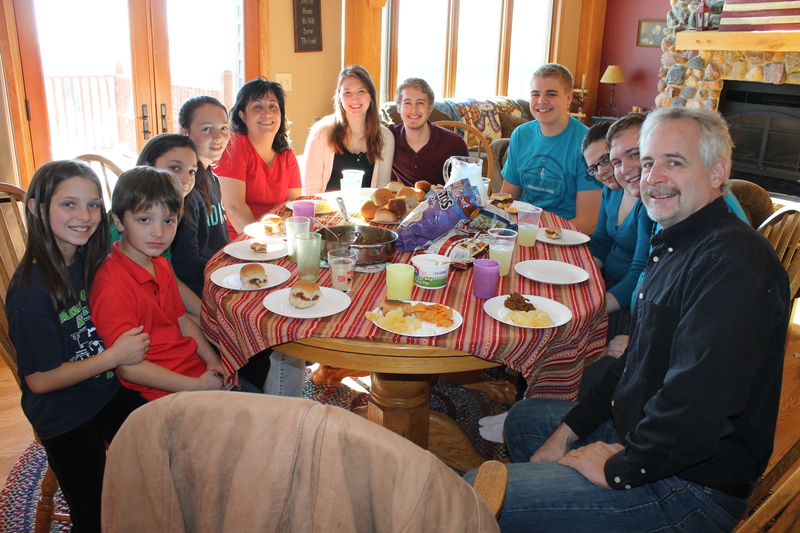 Home church of the team that came to Nassau to serve at the ALC&C in April. 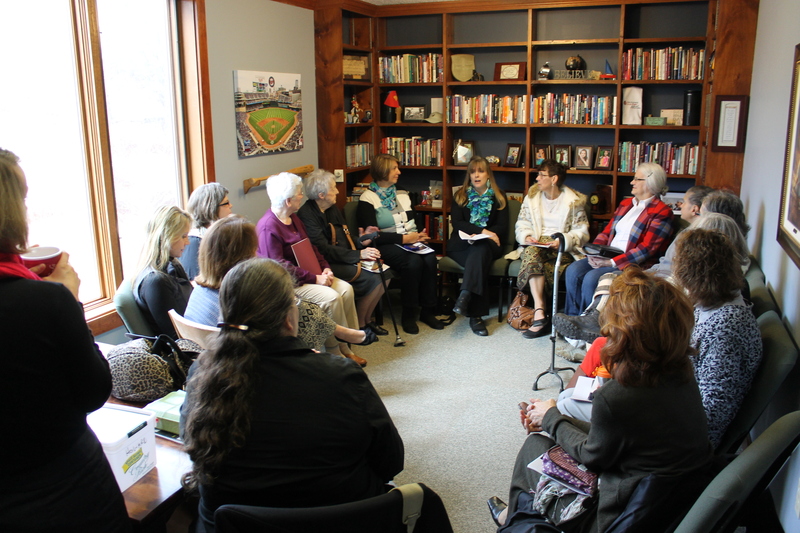 On Sunday morning, I was asked to speak to the lady’s Sunday School class. 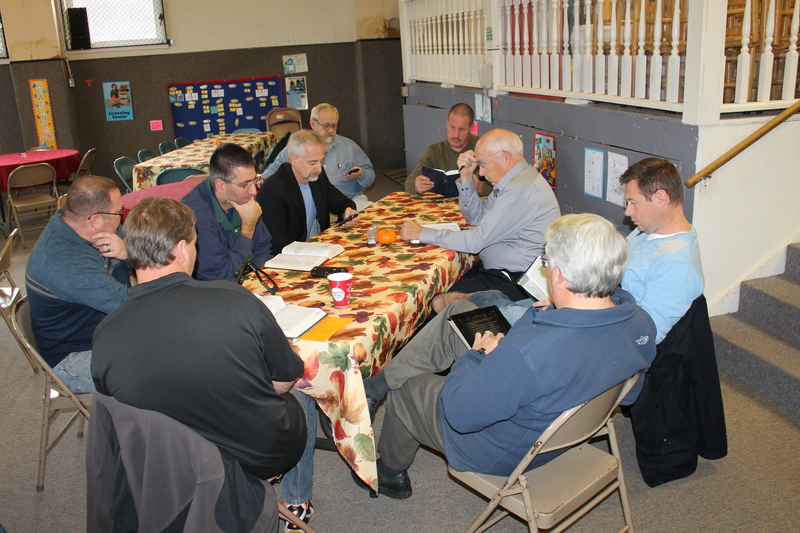 Tim joined the men’s Sunday School class. During the morning service, we shared the ALC&C ministry with the church. We took a few minutes to stop in and meet Pat’s mom. 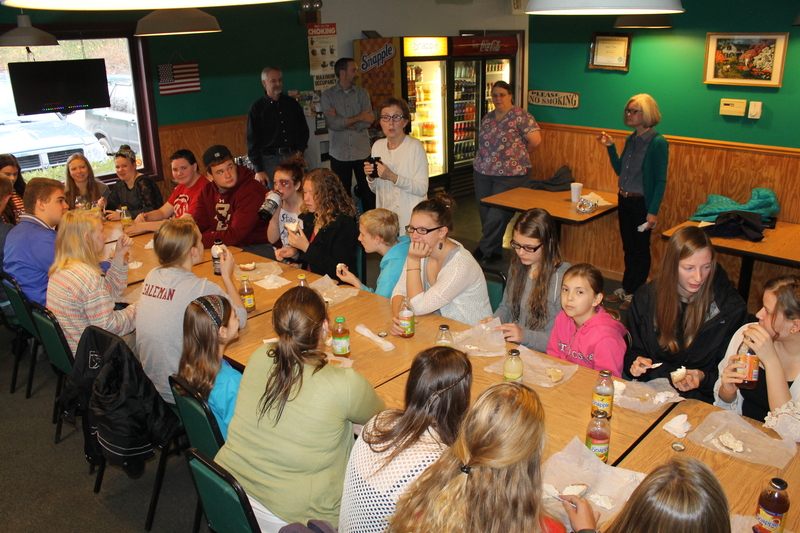 On Tuesday morning we met at a bagel shop in Delhi to share a devotional with the youth group from the church before the youth went to school. After attending the Bagel club, we headed east towards Connecticut. 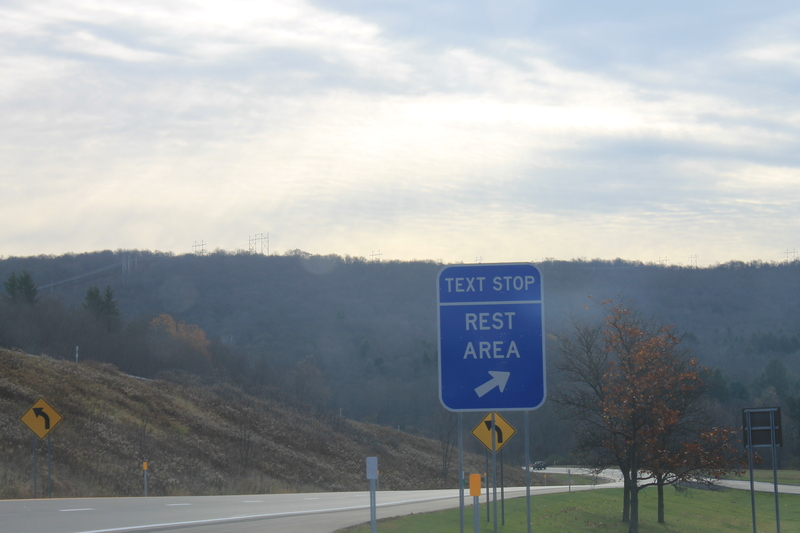 The state of New York has “text stops”. We saw a sign on the road on the way to Connecticut for a Military Museum. 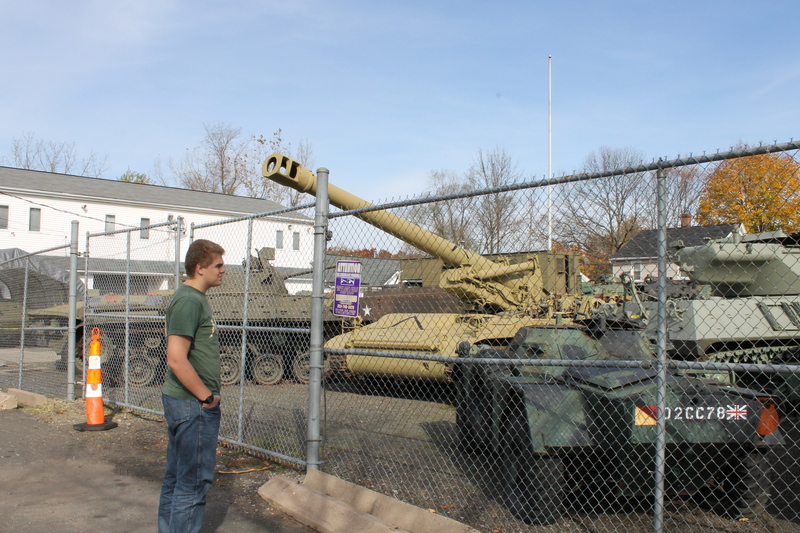 We stopped for Zachary to see the equipment, but the museum was closed. 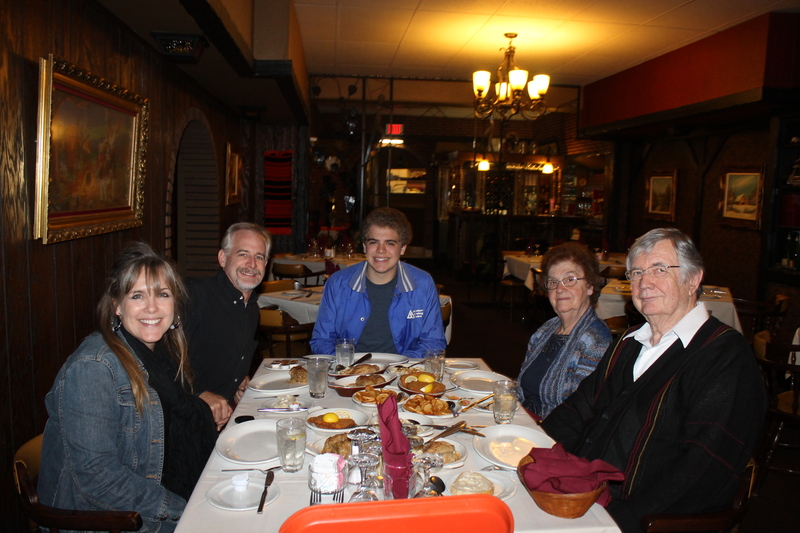 We stopped in Ridgefield, Connecticut to eat at the restaurant that belongs to the aunt and uncle of one of our facilitators, Josie Sorena. 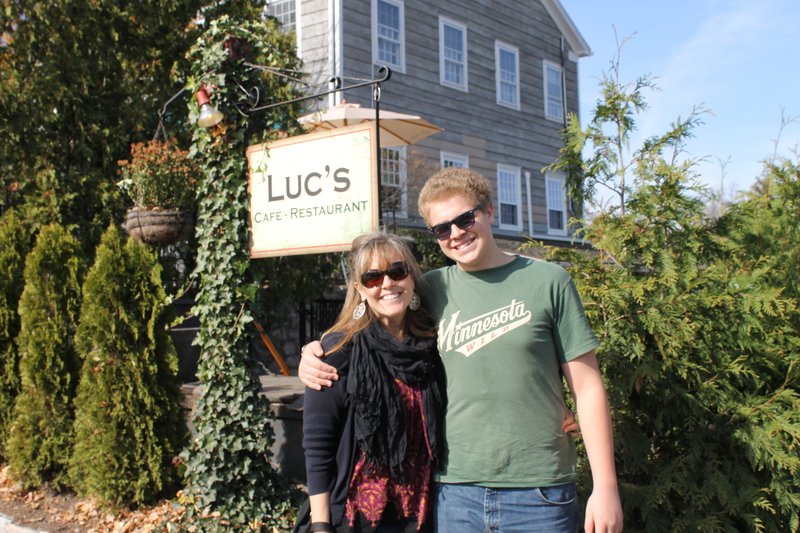 The French Cuisine at Luc’s Cafe was so good. After lunch, we met with Chelsea Kingston, Youth leader of Walnut Hill Church in Bethel Connecticut. 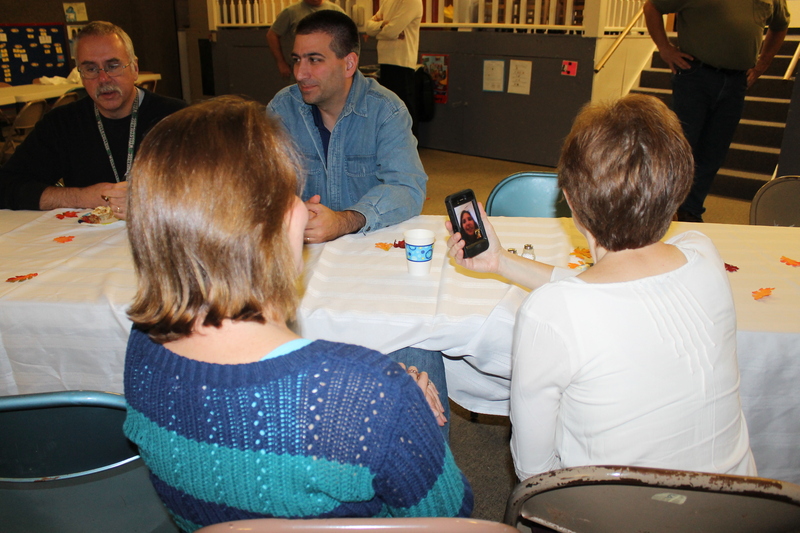 Chelsea brings mission teams to Nassau. That evening Chelsea took us and Josie Sorena’s parents and brother and John (a young man that came on one of the mission teams) out to an Italian Restaurant to visit. 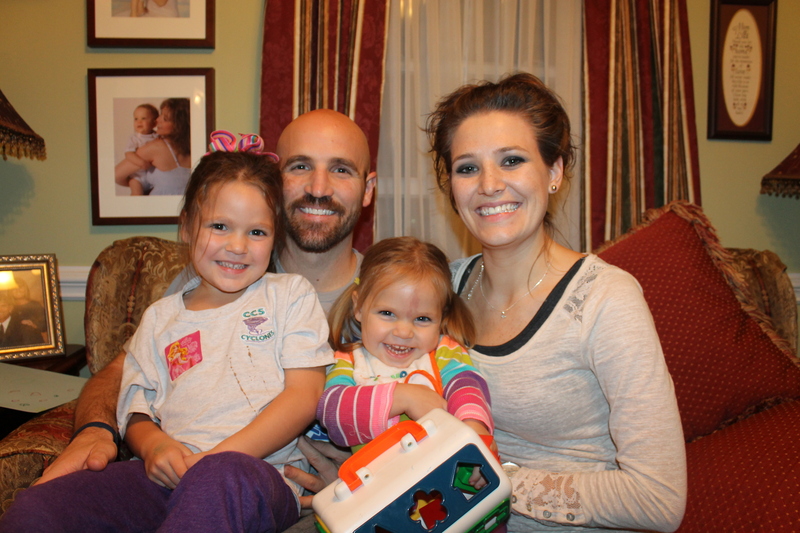 We enjoyed getting to know Josie’s family. Connecticut had some beautiful fall colors for us to enjoy. This Japanese Maple was stunning. It is in front of the house of our host/hostess, Jim and Laura Kennedy. After we left Connecticut, we headed to Long Island, NY. We saw a road sign that said “Shelter Rock” and reminded us of the Shelter Rock Mission team that had been at Camp this past July. We decided to stop in and see a few of the team members. This is Pastor Kevin. 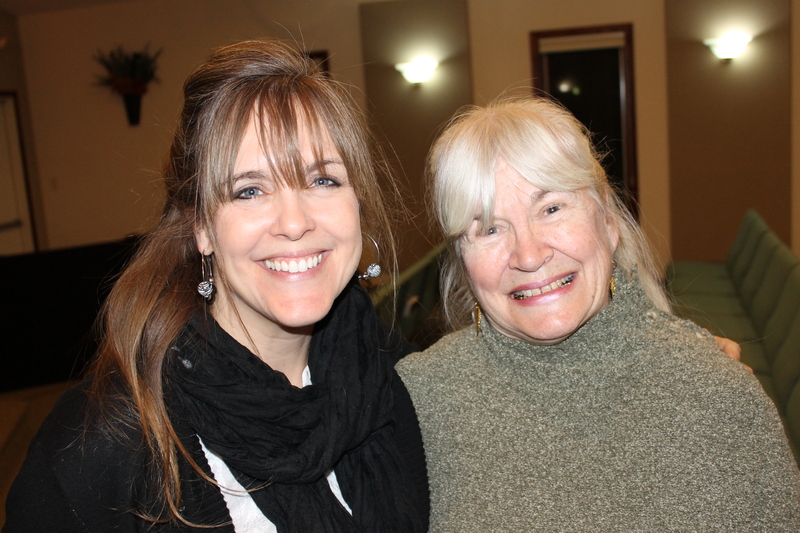 With Julia at Shelter Rock Church. 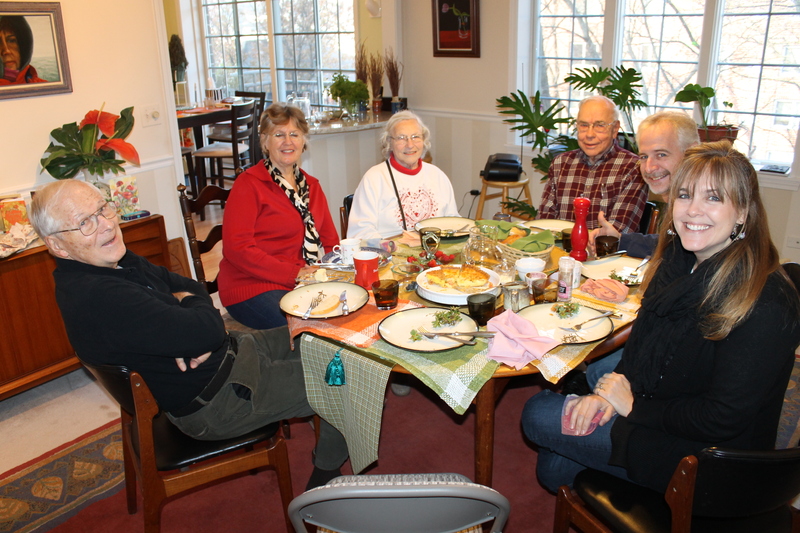 We stayed with former board member, Humphrey Duncanson and his darling wife, Marilyn while in Long Island, New York. Our days have been busy, “doing” ALC&C work, and we have had no touristy days. 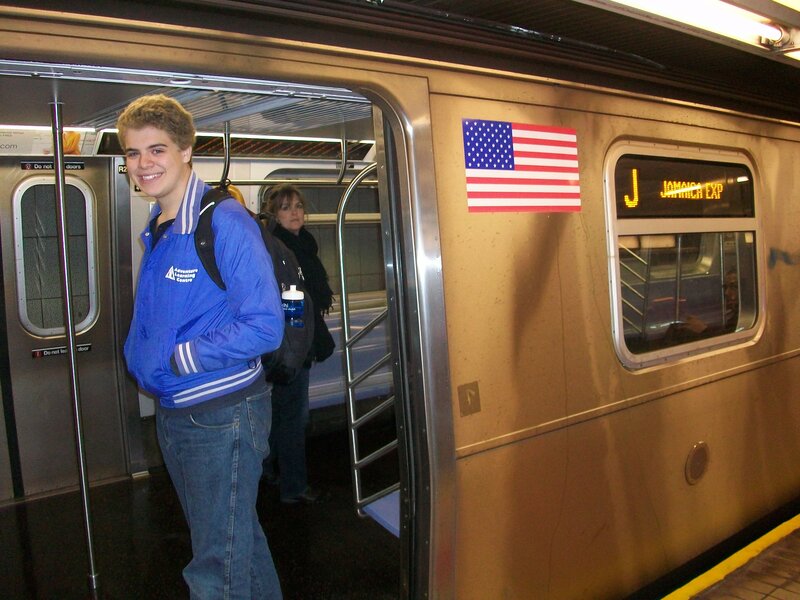 On Thursday, we decided to take Zachary to downtown New York. 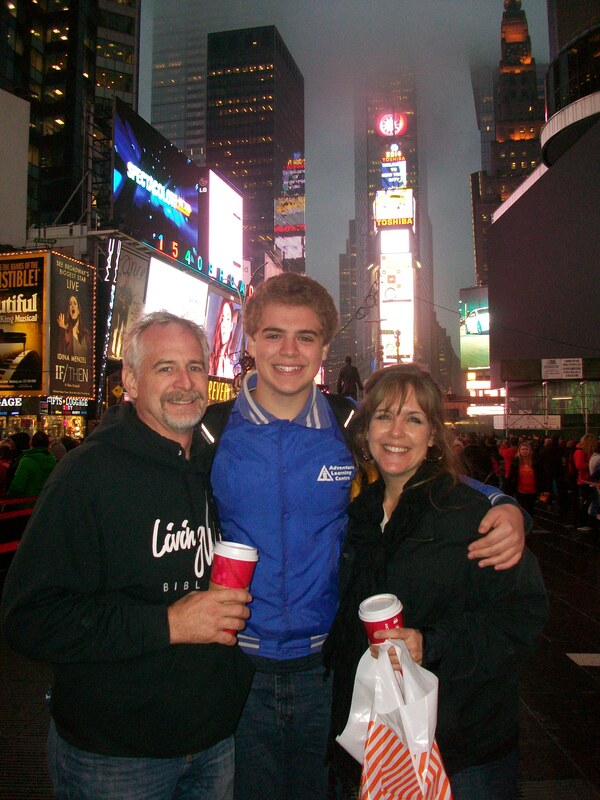 It was rainy and dreary, but we enjoyed our day in the Big Apple very much. On Facebook we noticed a young lady we know from Minnesota was living and working in Manhatten. 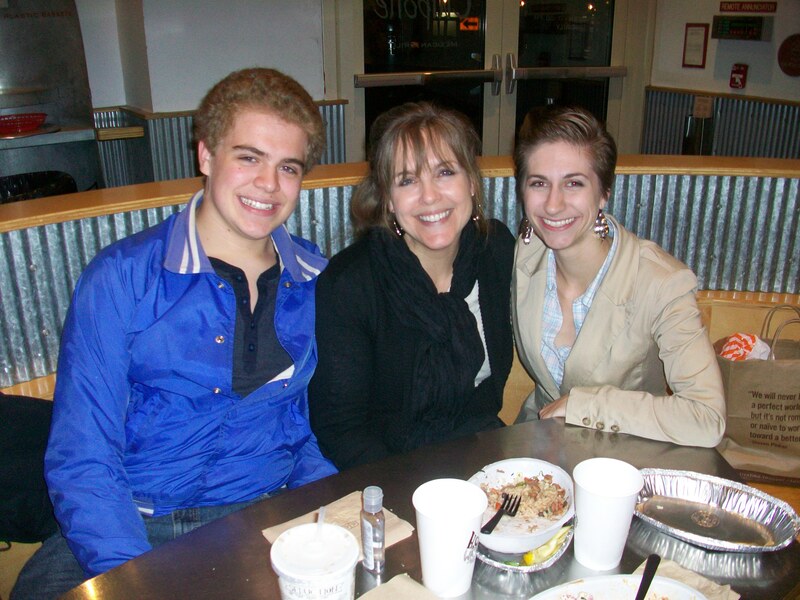 We made arrangements to meet her for dinner at Chipotle. This is Autumn Kovach. This is Kurt Weaver. 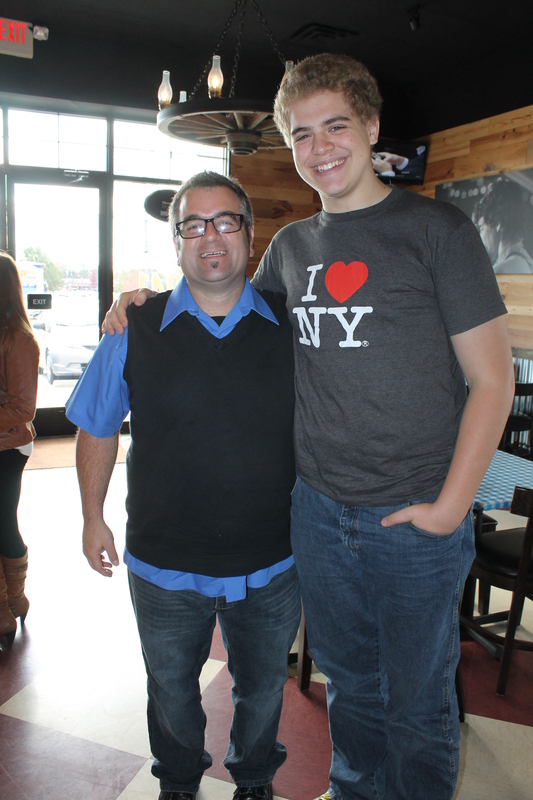 One of the pastors of Crossway Church in Lancaster, PA. He picked us up at the Baltimore, MD airport. 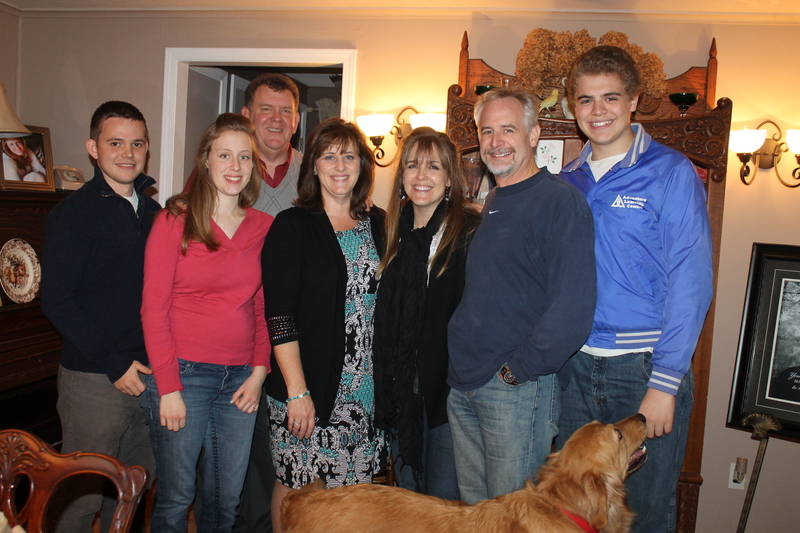 This is Kurt and Barbara Weaver’s beautiful family. 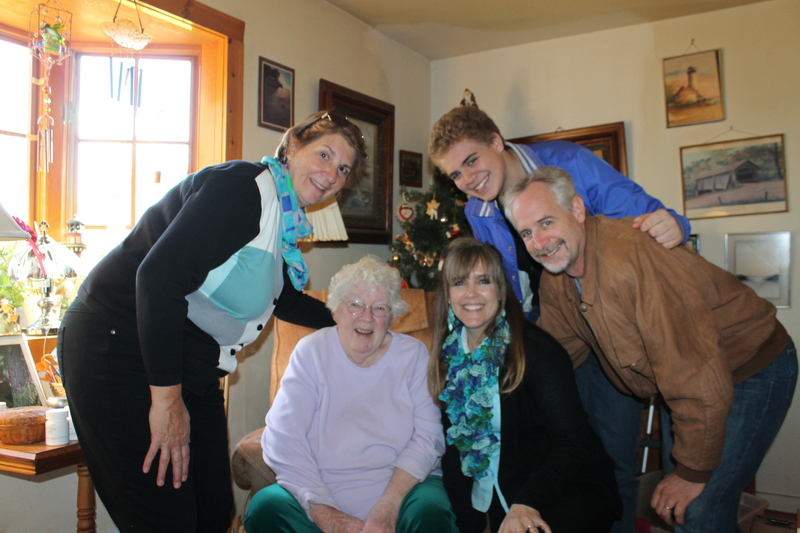 We had such a wonderful time at their home. They spoiled us. They generously gave up their master suite to us. We felt like we were in a luxury hotel. We got to play made-up games with the girls. While Zachary played outside with the boys. 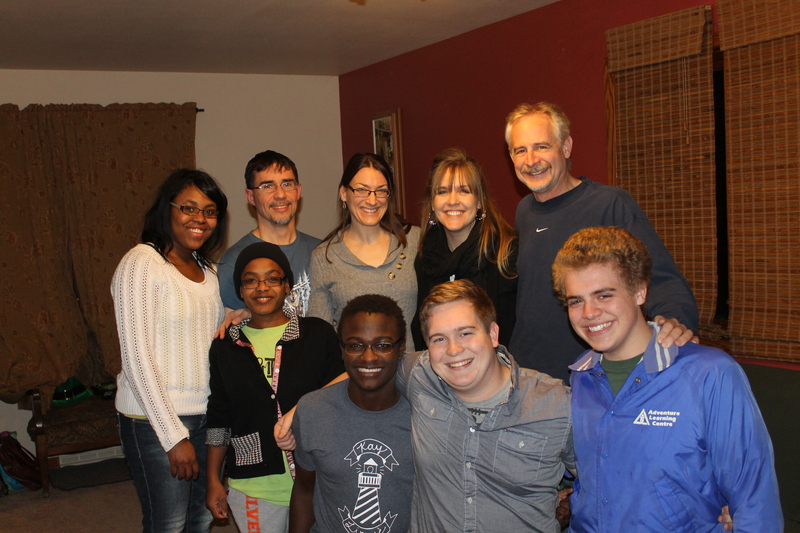 On Saturday evening, several of the E-team mission team that had come to Nassau in May met at the Weaver’s house for a reunion. 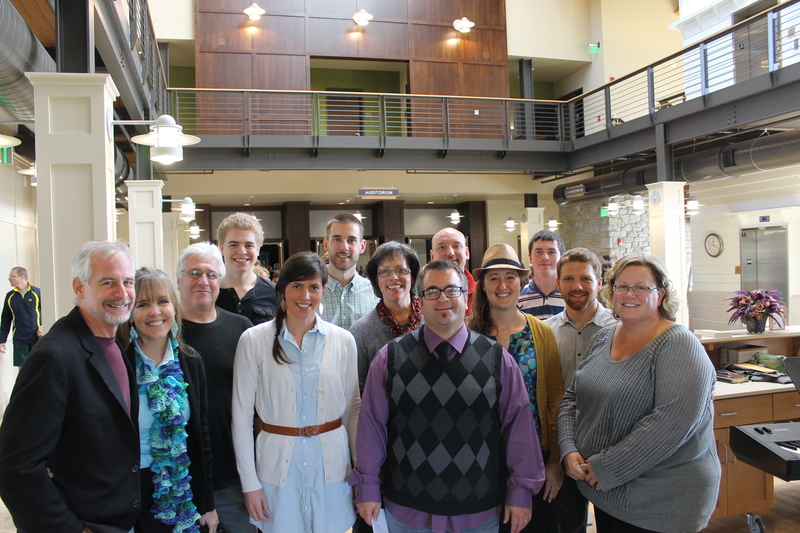 On Sunday morning, we presented the ALC&C ministry to Crossway Church. After church, we met with a few more of the E-team members. Grandma practice! I love these little girls, and boy were they fun to be with! 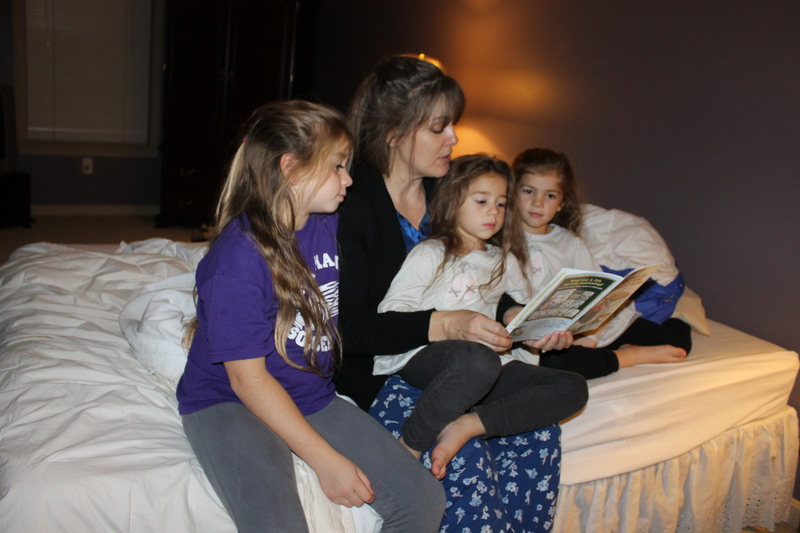 Story time before bed the night before we left. This is Jon and Lisa Harris. Jon is my cousin. 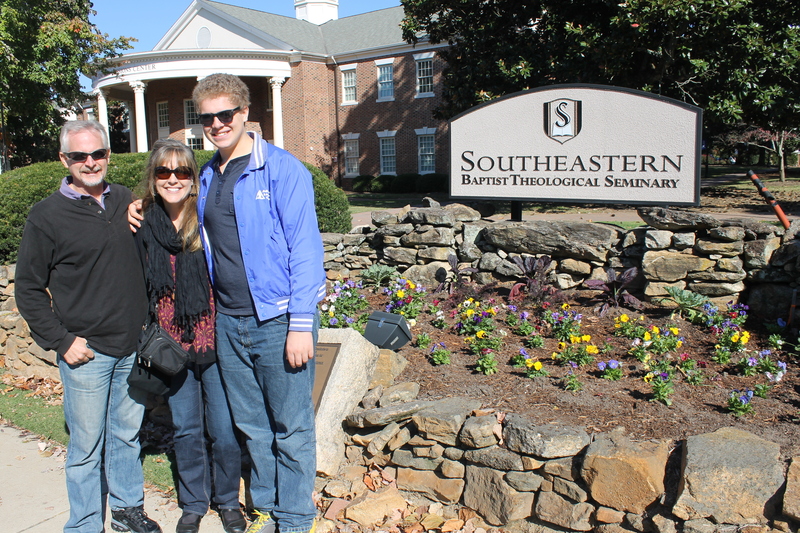 We had a great time visiting with them. As always, the time was way too short. Their son Drake is a year older than Zach. Drake is such a nice young man. We enjoyed getting to see him again. 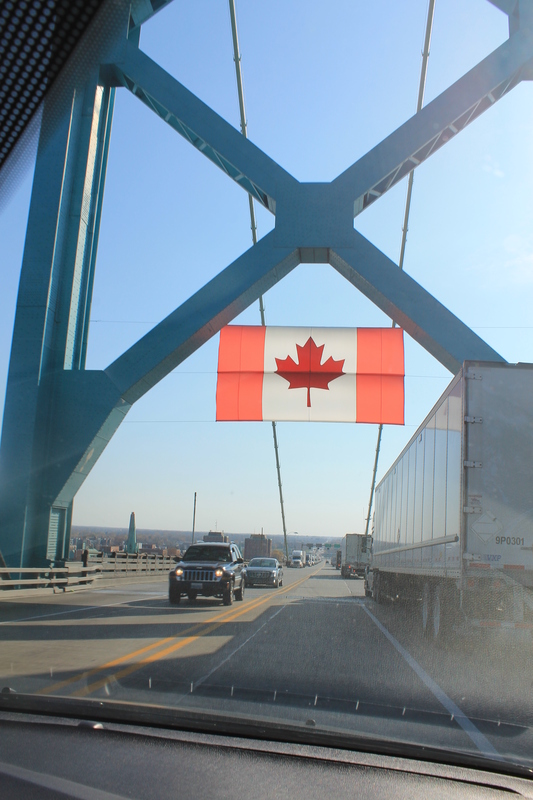 We crossed the border into Canada. We met up with Sam and Lil Tissot. Sam is one of the original ALC&C board members. Tim and his sister grew up with their children. 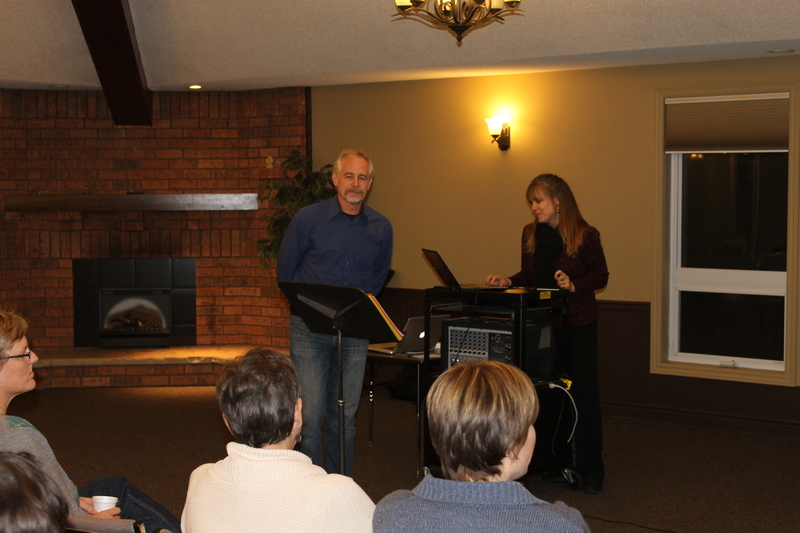 That evening we attended Grace and Truth Chapel’s Bible Study and Prayer Meeting and were able to present an update on the ALC&C ministry. 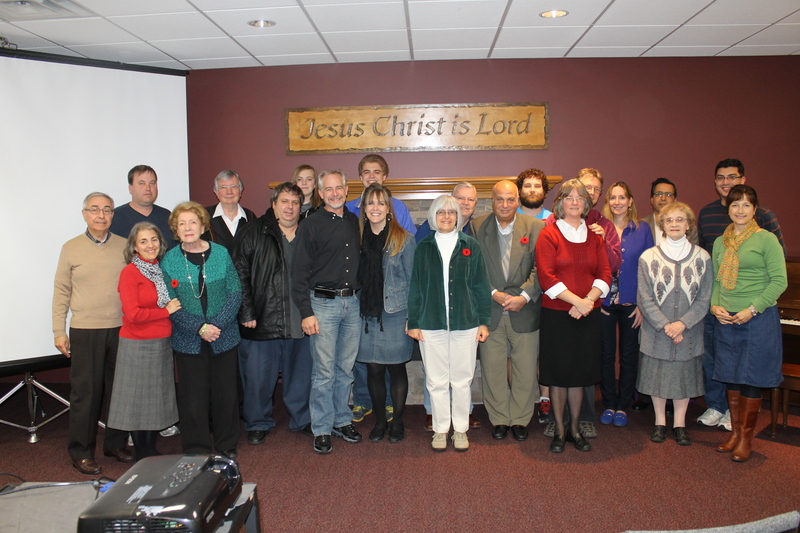 This is the group of believers that met with us that night at the prayer meeting. 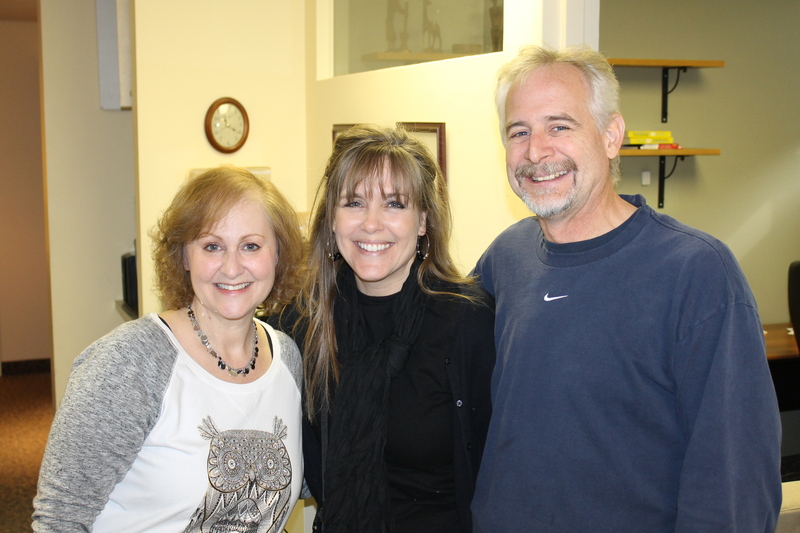 We got to spend some time with Erica Turner. She spent a year at Living Waters Bible Camp a couple years ago. I had the chance to mentor her that year. 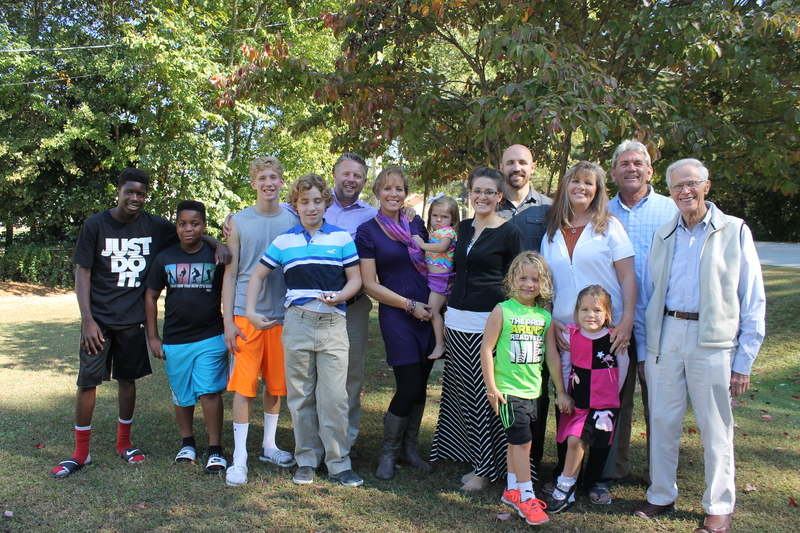 We also got to spend some time with the Glardon family. 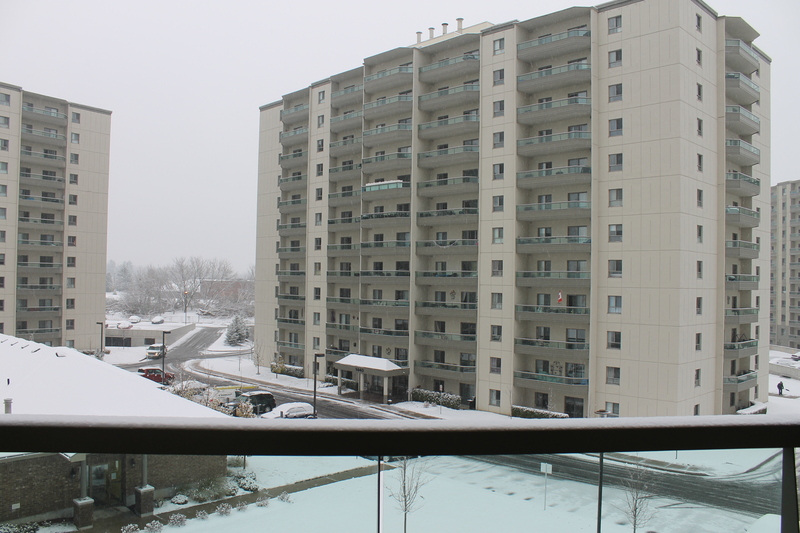 We are currently in London, Ontario. We are staying with Bob and Faye Browning. Bob and Faye snowbird with us in the Bahamas every year. 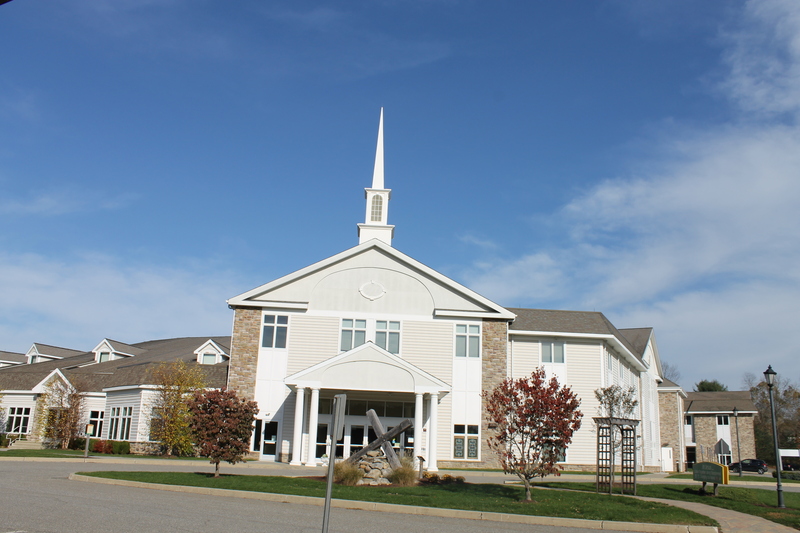 This weekend we will be meeting with their church. 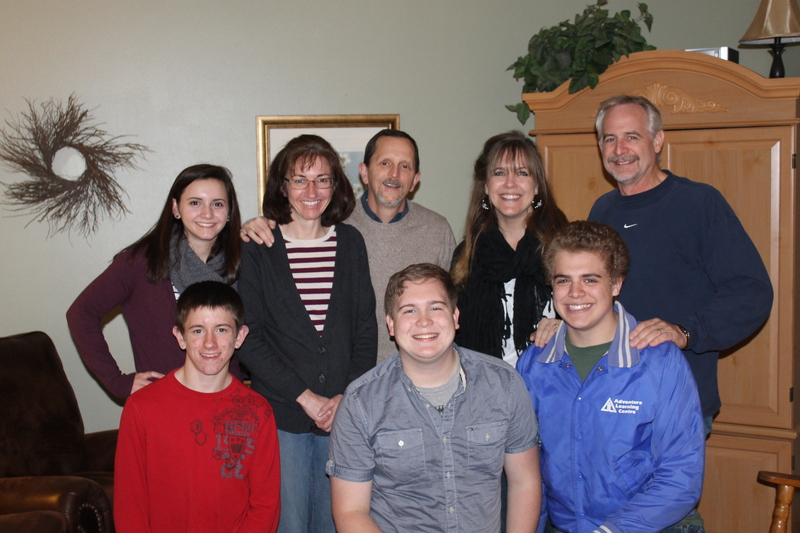 The church is sending a mission team to us in January. Staying with the Brownings feels like we are staying with our parents. 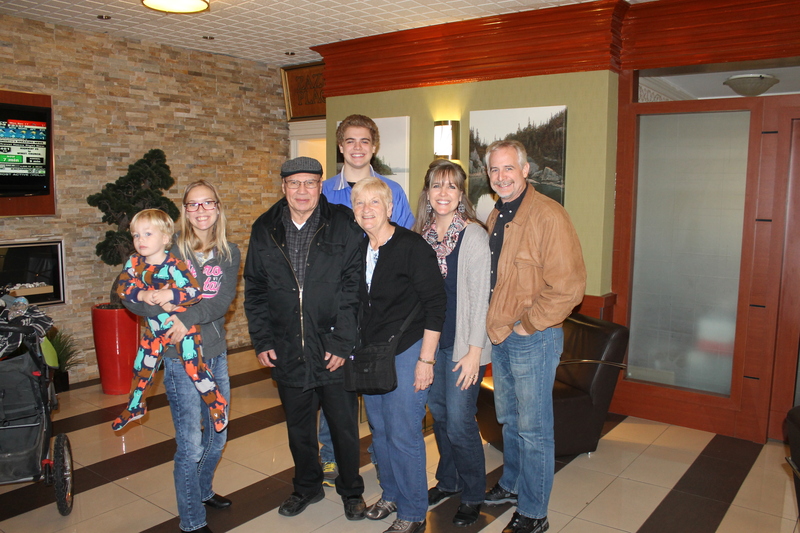 We are enjoying our time with Bob and Faye Browning and look forward to a relaxing, yet busy weekend here in the London area. Being with Bob and Faye feels like we are with one of our parents. Next week we will be heading back to the states. We will try to post again later next week. Thank you, Tim and Deborah Lamm for letting us use your coats! We have needed them up here in the Adirondack Mountatins of New York. Up until Wednesday when we left the Southern region of the United States, we have had cooler weather than the humid 80 degree weather we are used to in the Bahamas, but for the most part it was still comfortably warm enough for our thin Bahamian-acclimated blood. 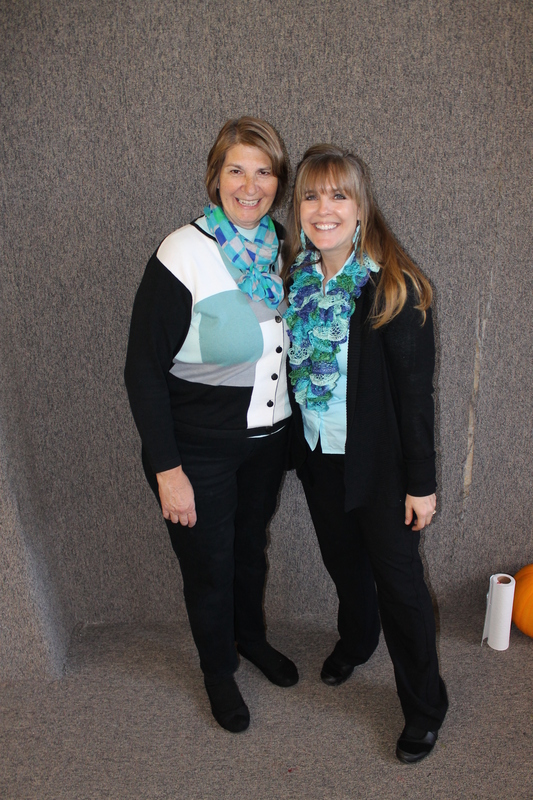 In fact we have really enjoyed the ability to wear long pants, sweaters, scarves (Mindy) and closed toed shoes. Since our arrival in upstate New York, we have had to add another layer- a heavy jacket. Thank you to our dear friends, Tim and Deborah Lamm, in Wilson, NC, we now have jackets to wear. We are suppose to have snow here this weekend. 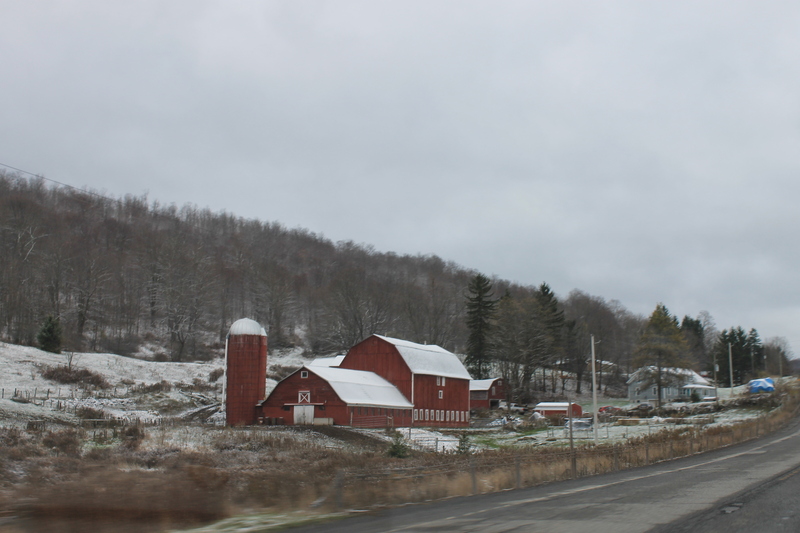 We are looking forward to seeing the white stuff, but please pray for safety as we travel the mountain roads here in New York. Last Saturday, we flew in to Raleigh/Durhan, NC. 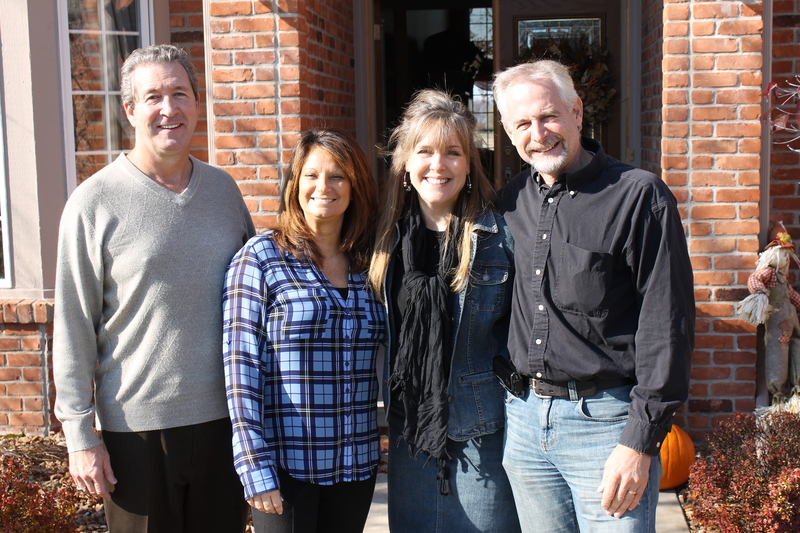 Tim and Deborah Lamm were there to pick us up. After lunch, we headed to their home town, Wilson. They drove us around their town and showed us their church. This is where we attended church the following day. 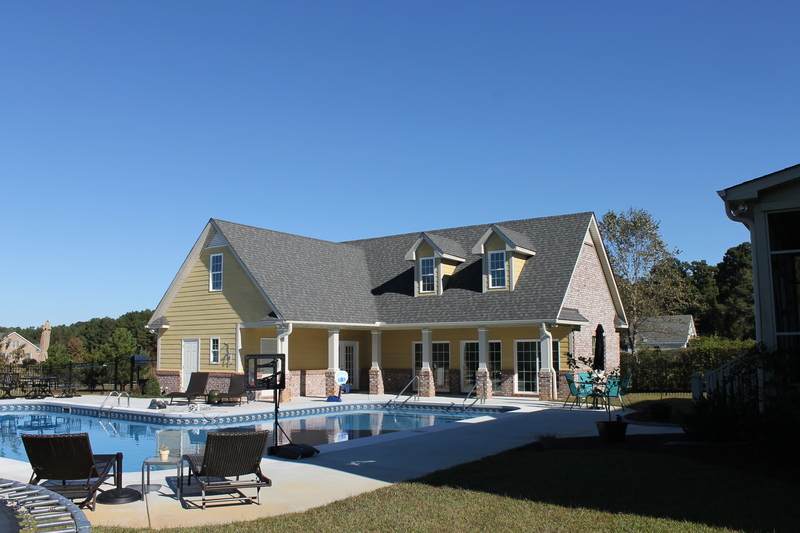 This is the pool house that belongs to Raymie and Dana McFarland (Dana is Deborah Lamm’s daughter). 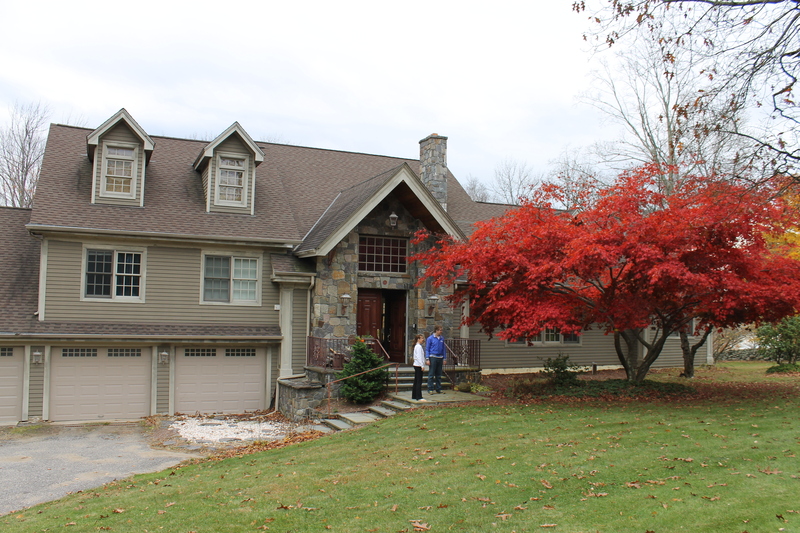 We were blessed with this gorgeous place for accommodations while we were staying in Wilson. We felt so welcome and pampered here. This is Brad and Kasey Perry. 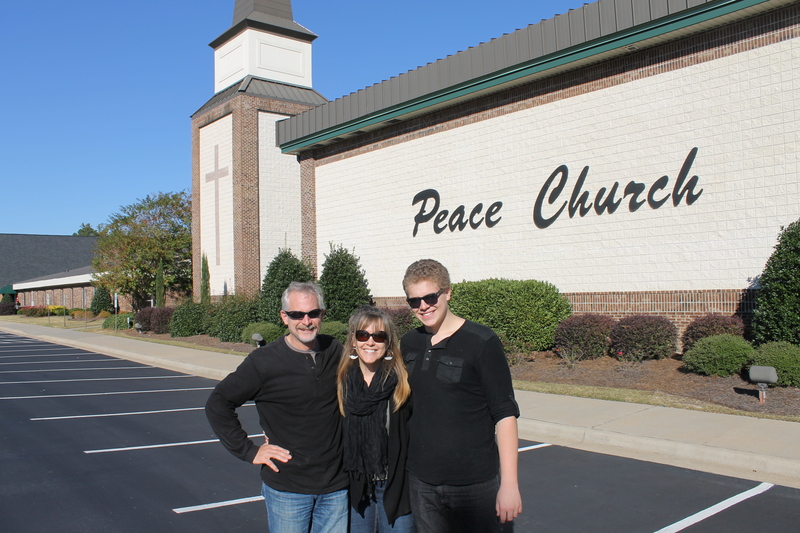 Brad is the youth and missions pastor at Peace Church. 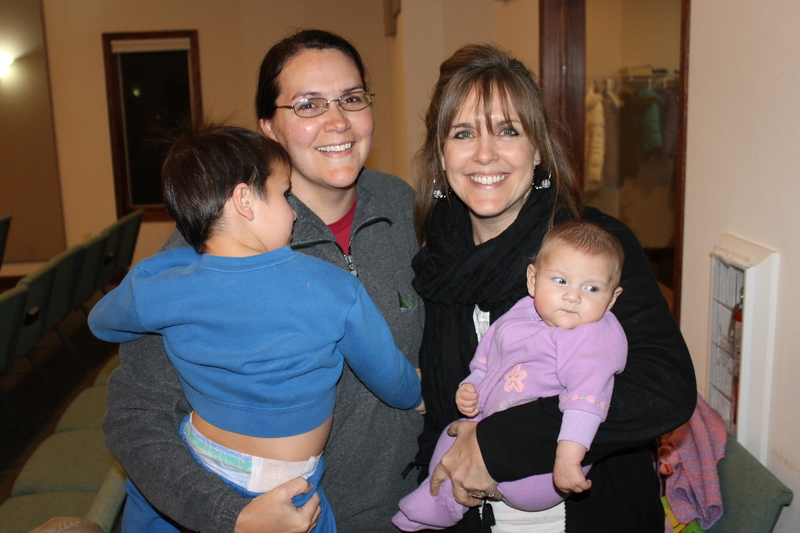 They have two daughters, Adriana and Adalyn. Brad and Kasey took us out to dinner at a really southern restaurant on Saturday night. Since my dad was a Kentucky boy, I grew up eating like this. It was great, but I sure could not eat like that everyday. On Sunday morning we attended Peace Church. We were able to see Ronnie and Francis Dilda. The Dildas had spent a month with us in the Bahamas in May. 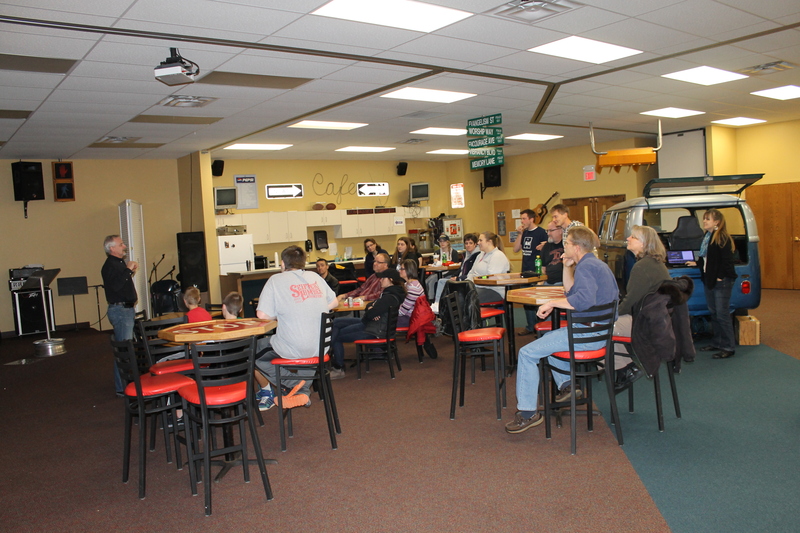 We had the opportunity to speak to the high school Sunday School class. 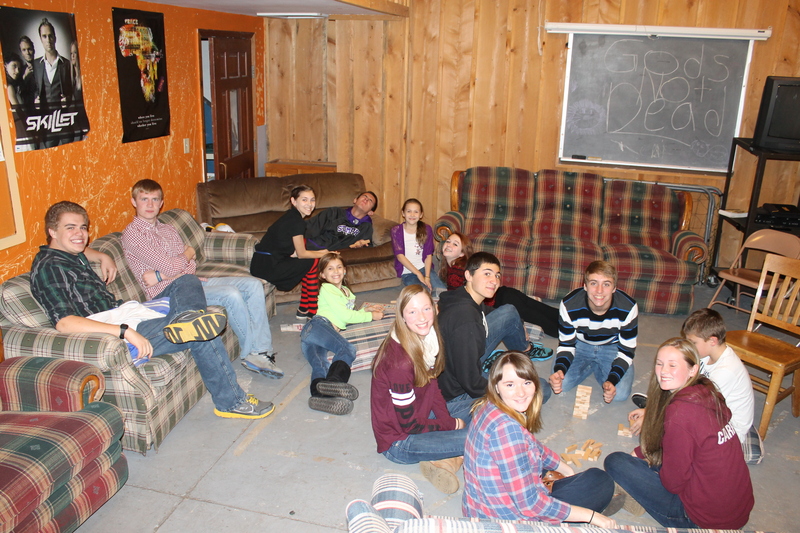 They are planning a mission trip to the Bahamas next summer. 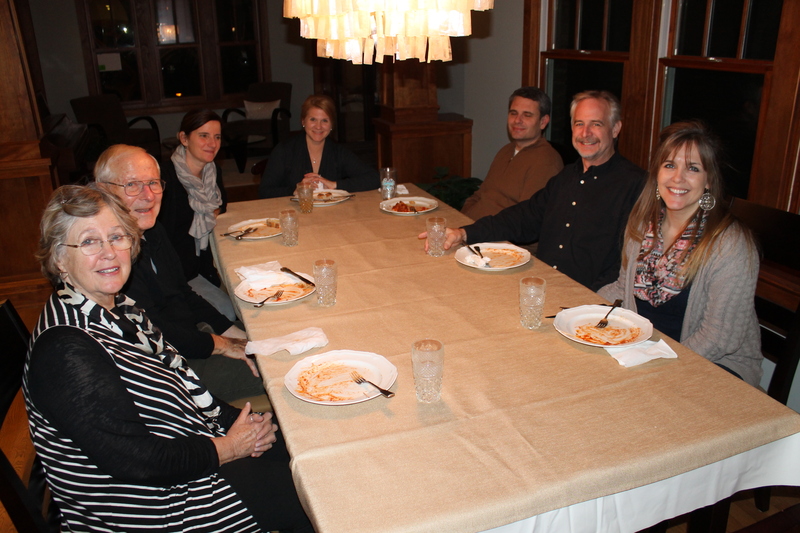 Following church and Sunday School, we all gathered at the Lamm’s house for their regularly scheduled family dinner. 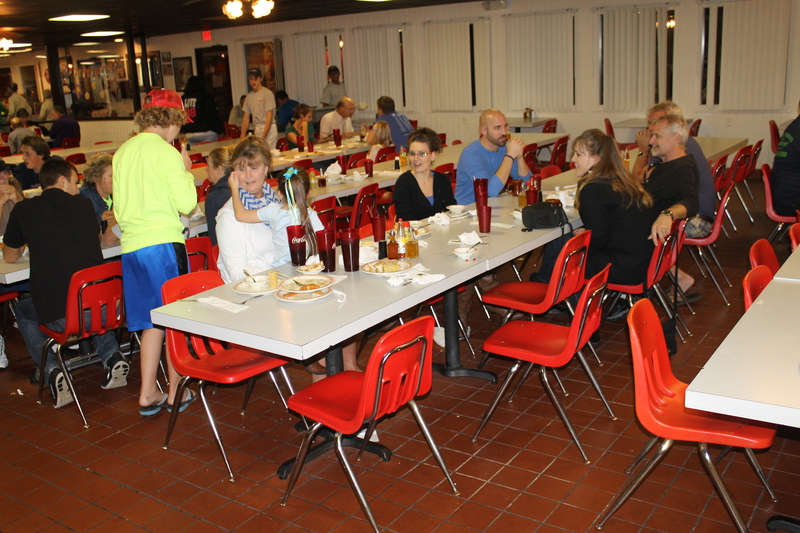 Of course there were Tim and Deborrah, Deborrah’s father, Brad and Kasey family and Raymie and Dana family. 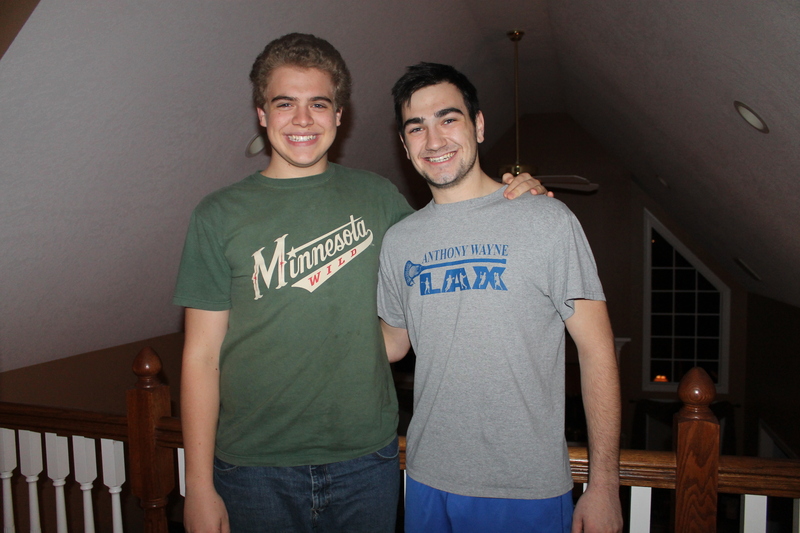 There were also 2 young men that were friends of the McFarland boys. 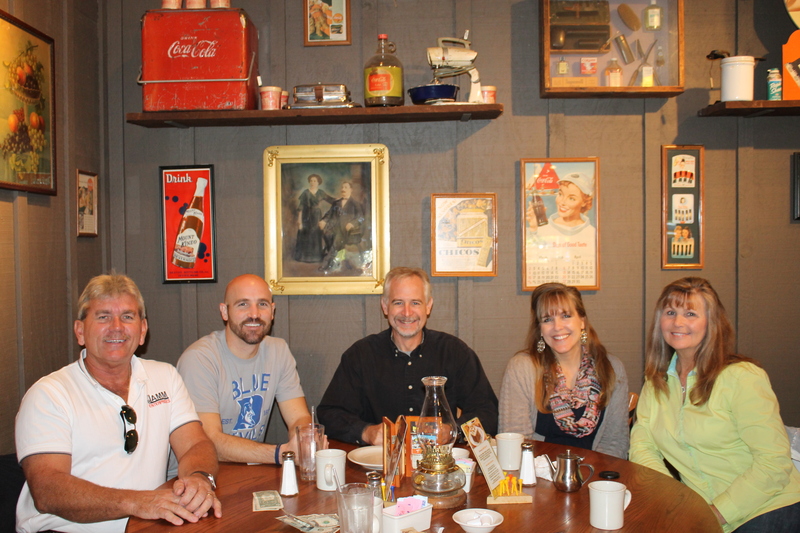 On Monday, Brad Perry took us out to Cracker Barrel. The Lamms joined us. 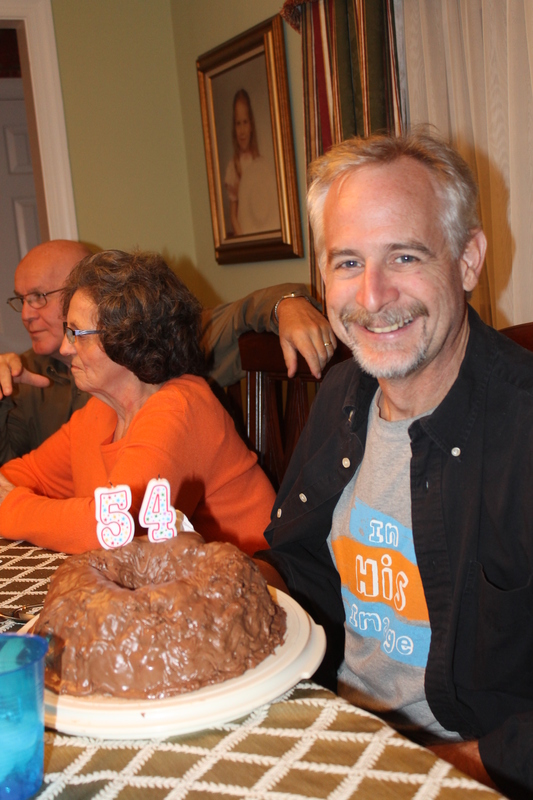 Monday, October 27th was Tim’s birthday. 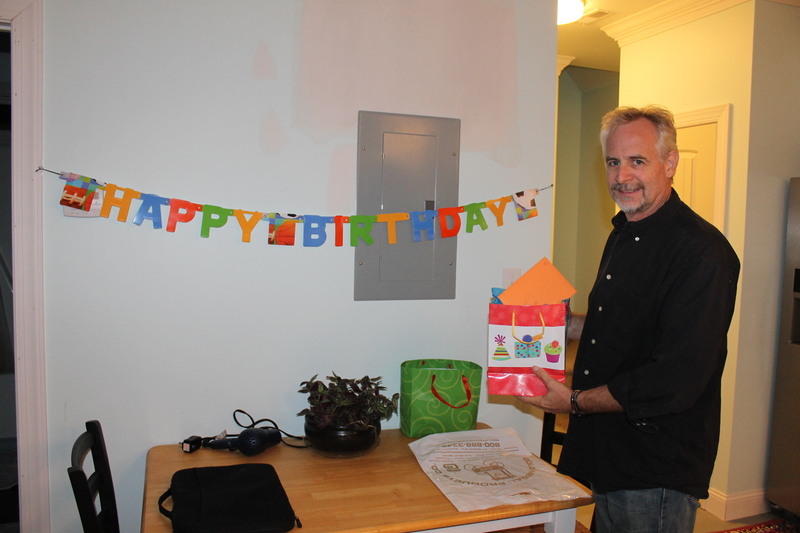 We had dinner at the Lamm’s house and they had a little party for him. 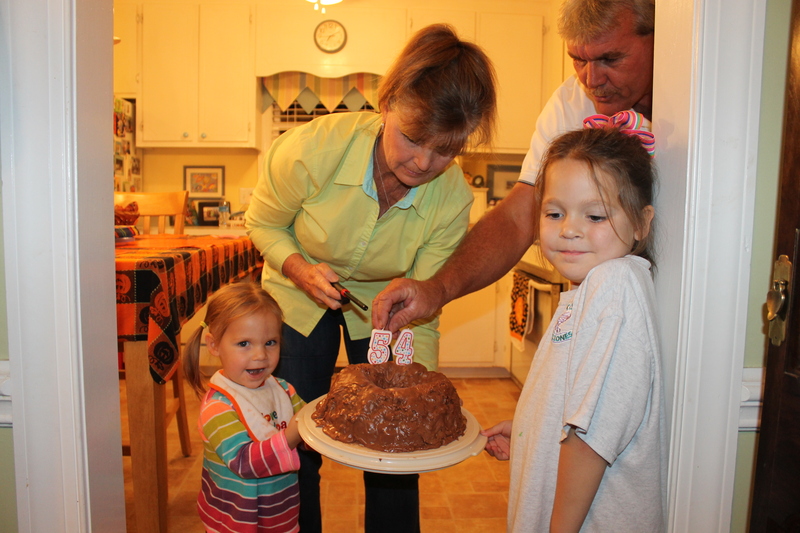 The Perry girls loved helping grandma and grandpa with the cake. 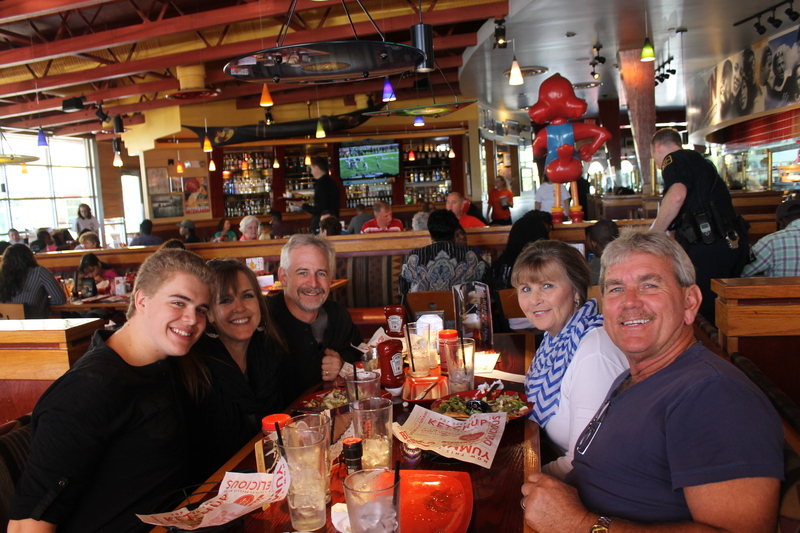 We were joined by two other couples that we met in the Bahamas when they came on mission trips. 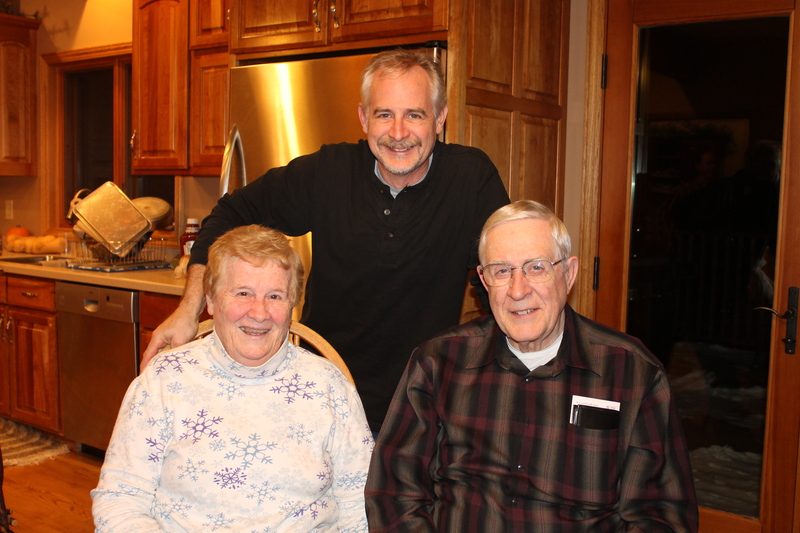 Nancy and Erwin and Herb and Barb. When we returned to the pool house that night. We found a surprise from Dana, hostess. They gave Tim a book. What gracious people! 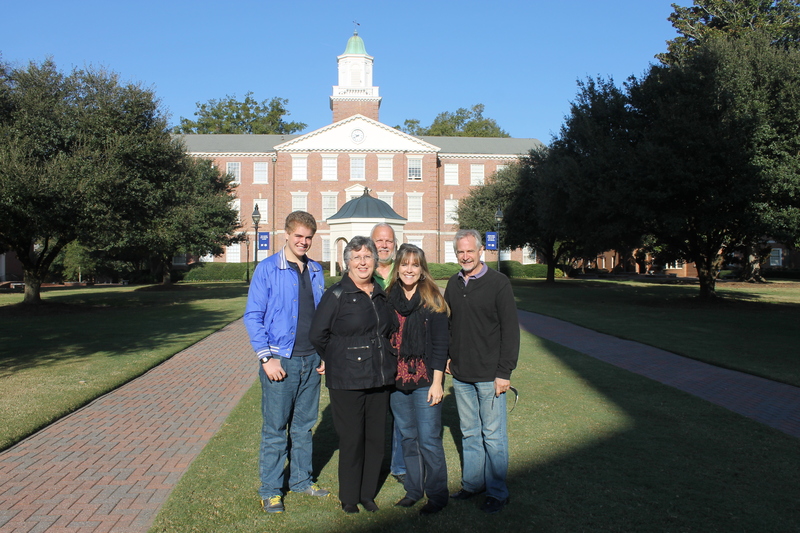 On Tuesday morning we went to Wake Forest, North Carolina and visited Southeastern Baptist Theological Seminary with the Dildas. 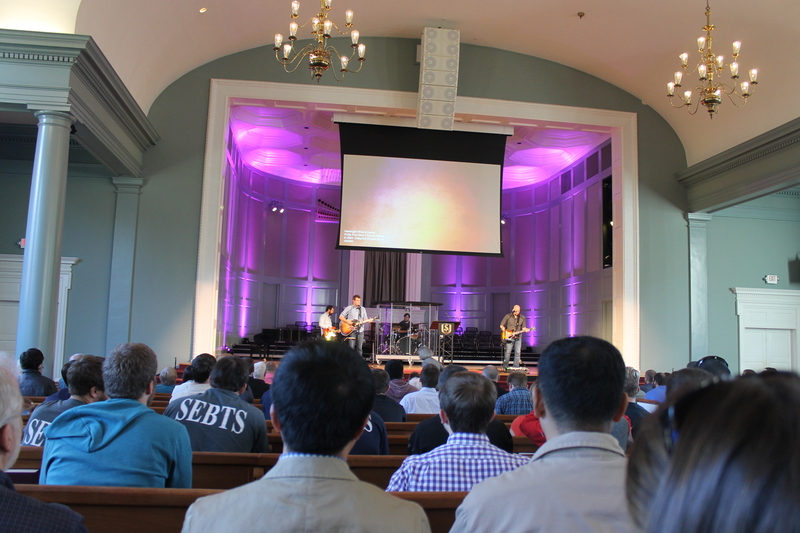 We were able to attend the chapel service. That evening we went back to the Dilda’s house for dinner. 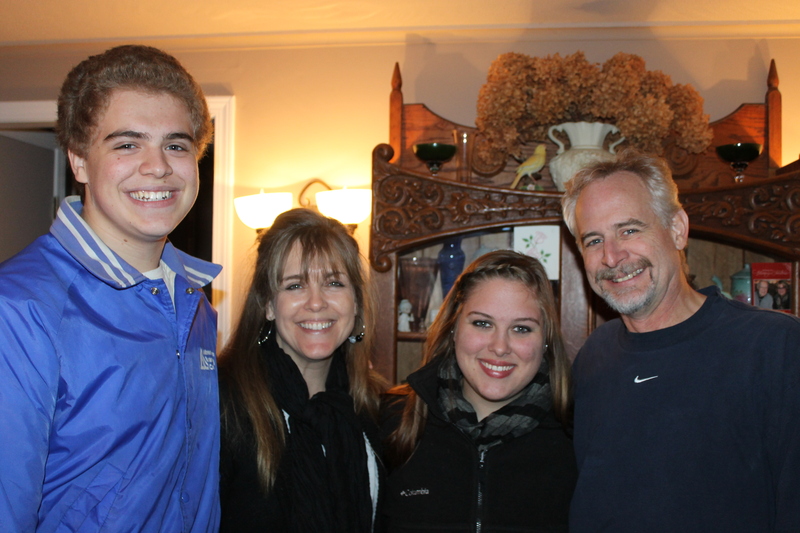 The Lamms met us at the Dilda’s house for dinner as well. On Wednesday morning we were up by 4am so we could make it to Raleigh in time to catch our 725am flight to Albany, NY. 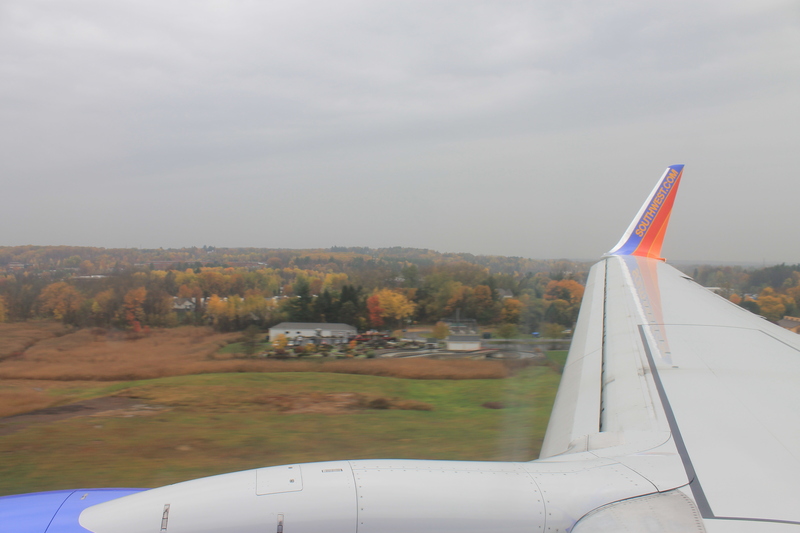 The flights gave us great view of the beautiful fall colors around the Baltimore and Albany airports. 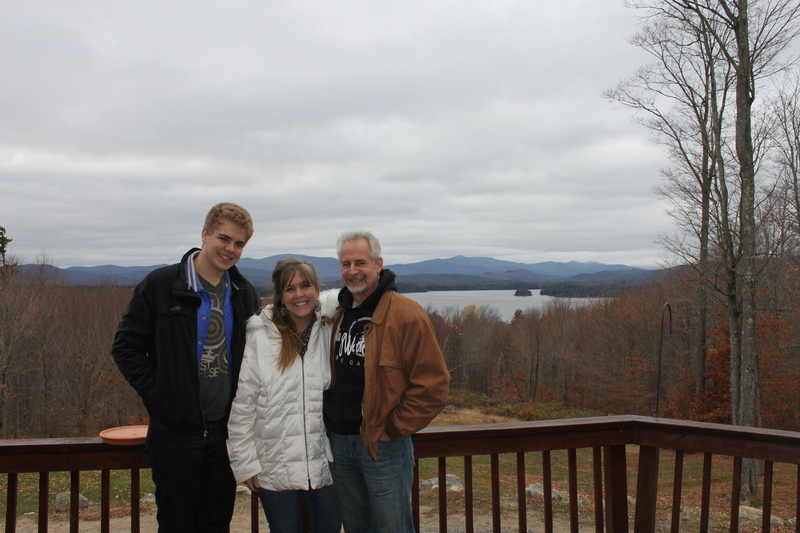 We rented a car and drove 1 1/2 hours north into the Adirondack Mountains. 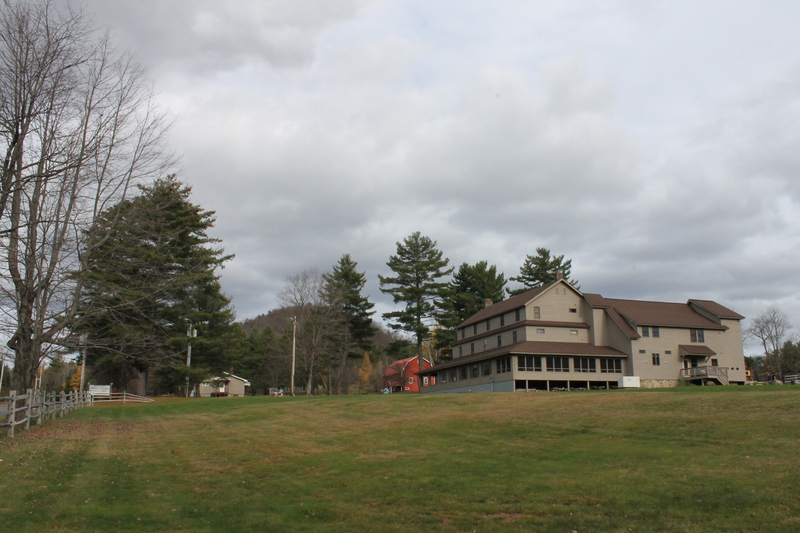 We stayed at Adirondack Bible Chapel Ministry Center. 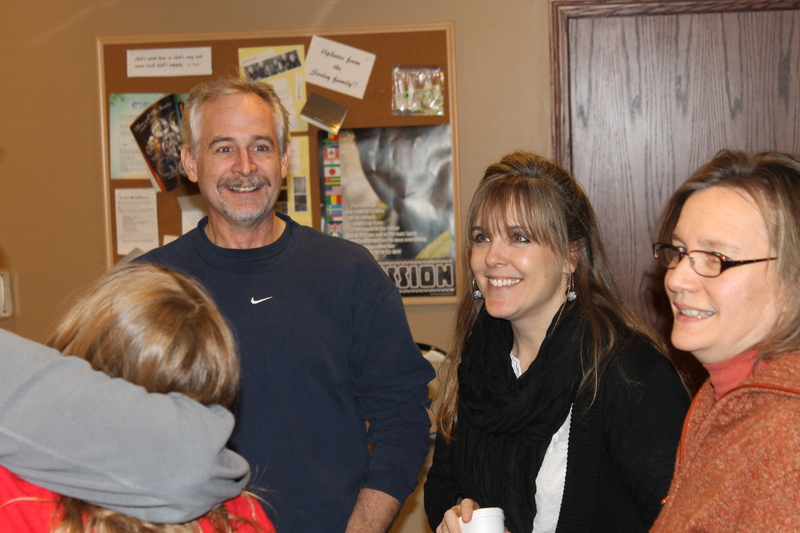 The ministry center is a place for rest and healing (spiritually, emotionally, mentally) and for discipleship. We were able to not only stay and rest here for a couple days ourselves, we also got to see what the ministry is all about. We were impressed with what we saw. 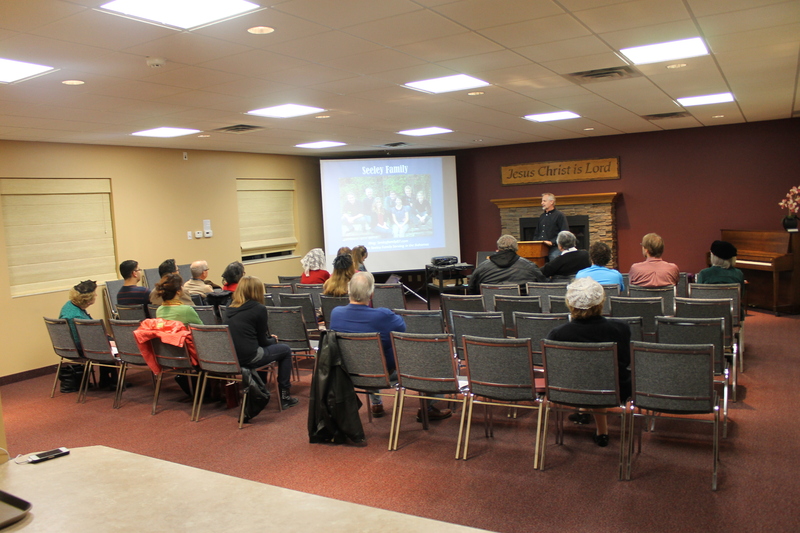 On Wednesday evening we presented the ALC&C ministry to Adirondack Bible Chapel. Pastor Ed Hart used to be on the ALC board and so the congregation are very familiar with the ALC from years of service there. It is exciting getting to reconnect. 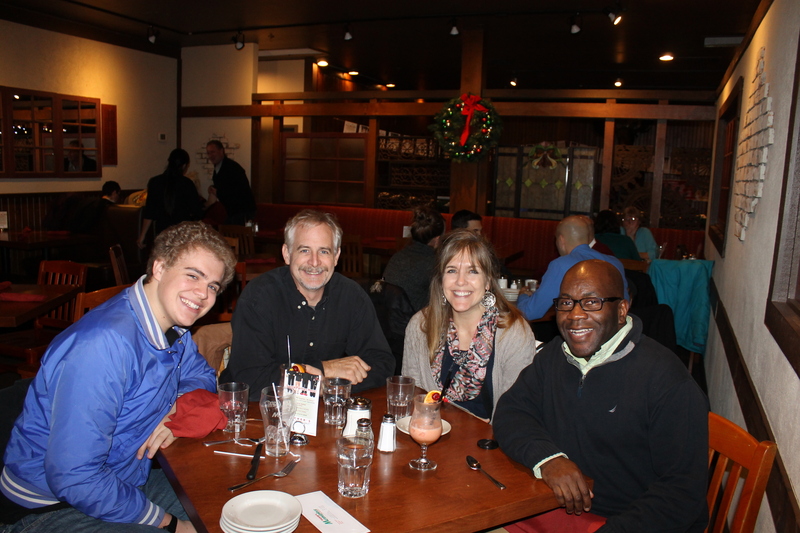 We had dinner with Pastor Ed on Thursday. His wife Faith was out of town, so we did not get to meet her. 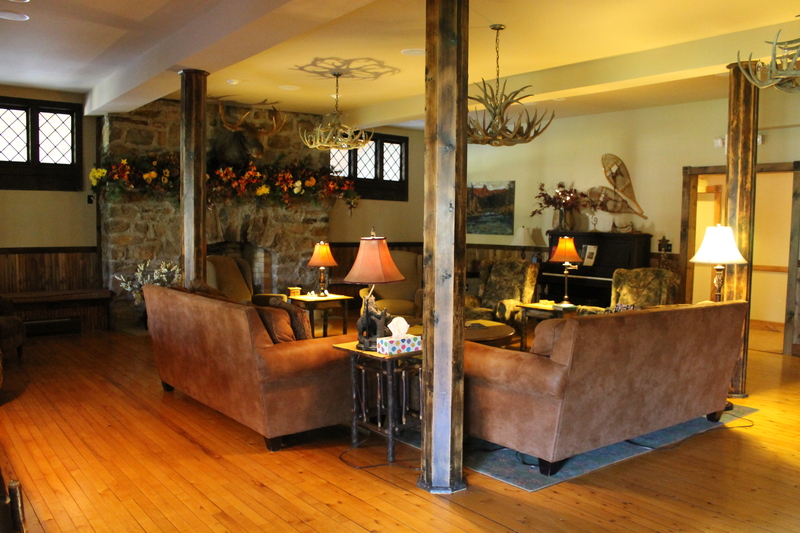 This is a picture of the common area in the lodge at the Ministry Center. Very relaxing! This is the common kitchen area. 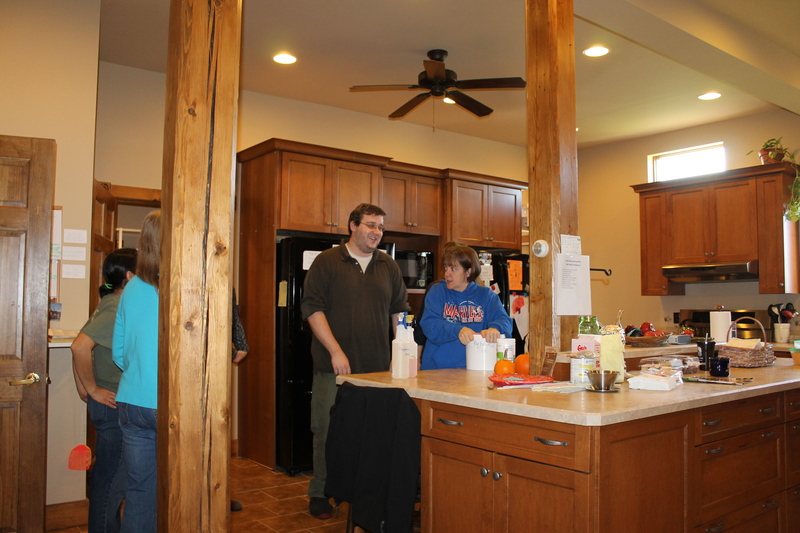 Here, some of the female staff and residents were cleaning cabinets and pantries. 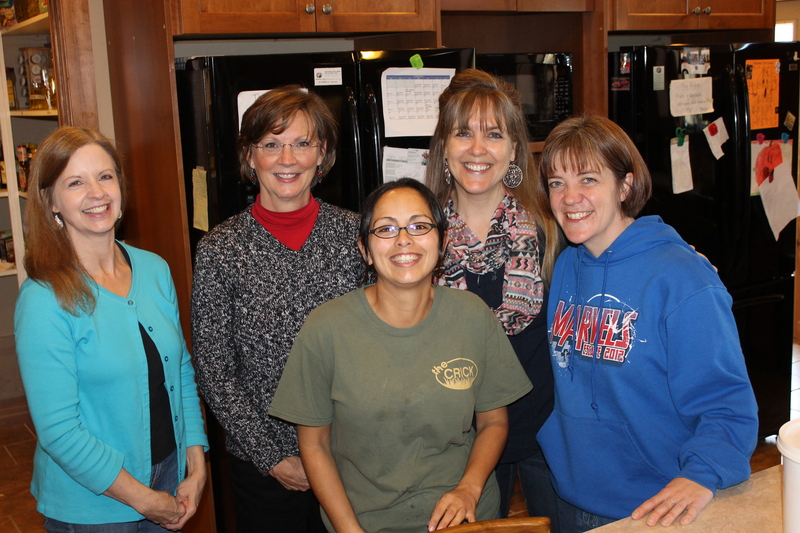 Some of the ladies staying and working at the Center. 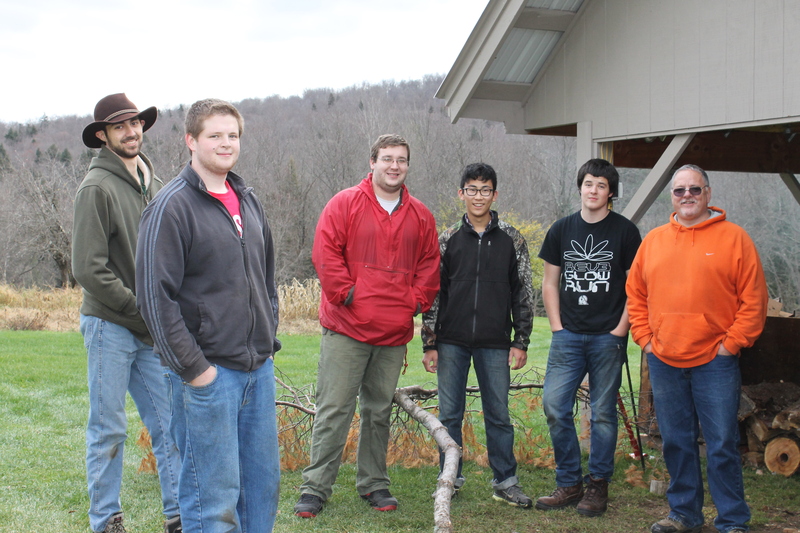 Some of the young men staying at the Center. 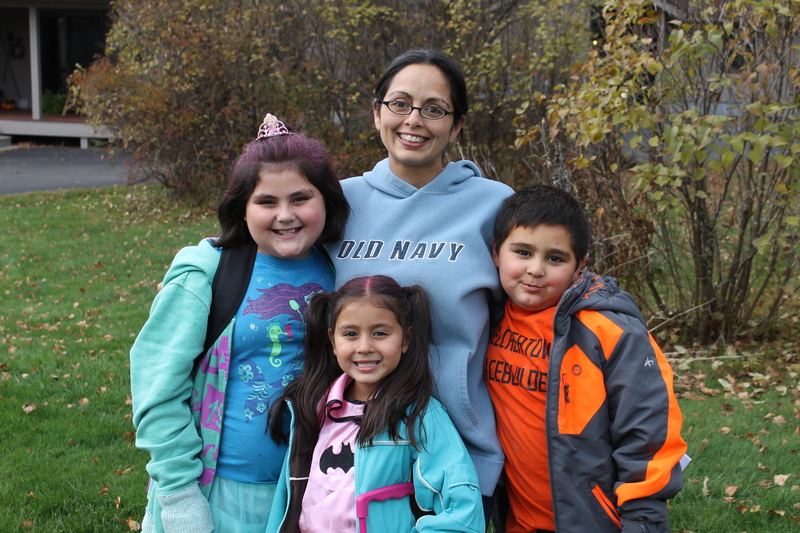 Angel and her darling children. They are staying at the Ministry Center now. 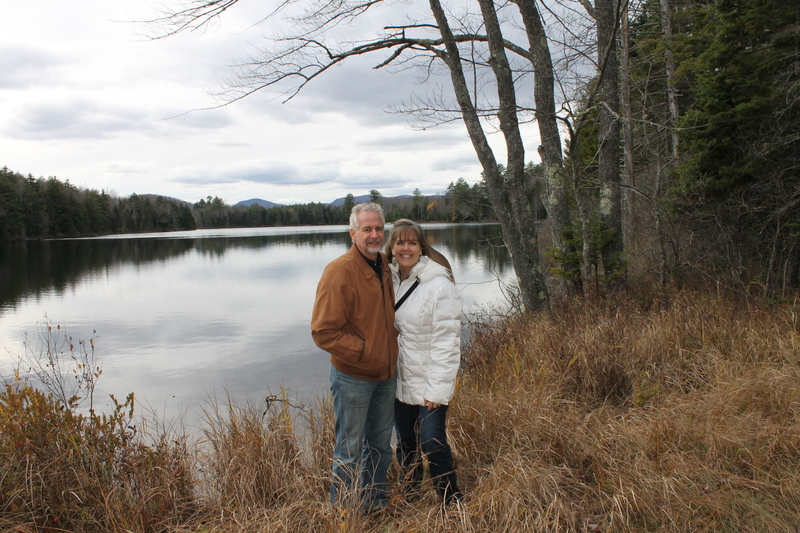 We had the opportunity to take a walk in the woods, in the mountains around this lake. GORGEOUS! 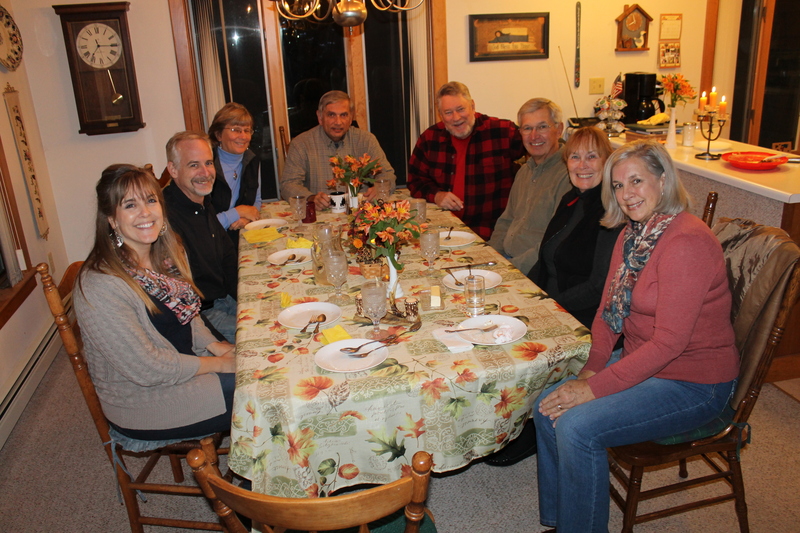 Our last night in the Adirondacks, we were hosted by Richard and Judy Olenik. 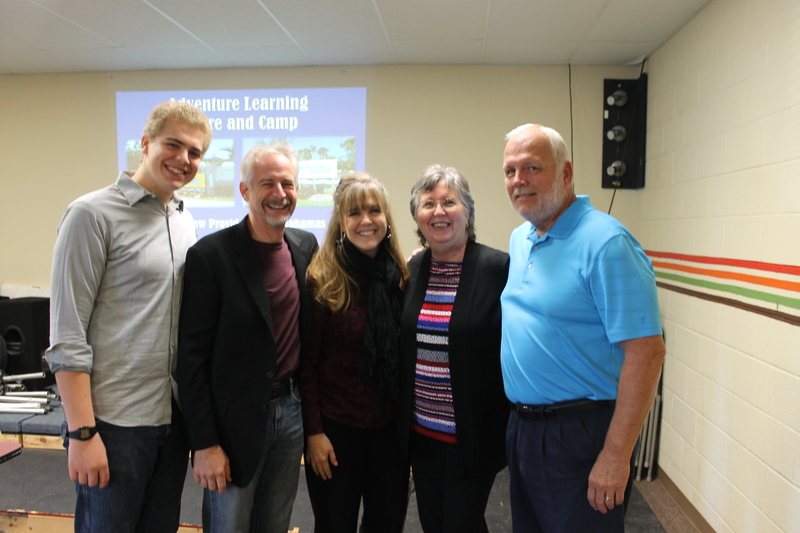 They are former Missionary Aviation Fellowship missionaries to Africa. 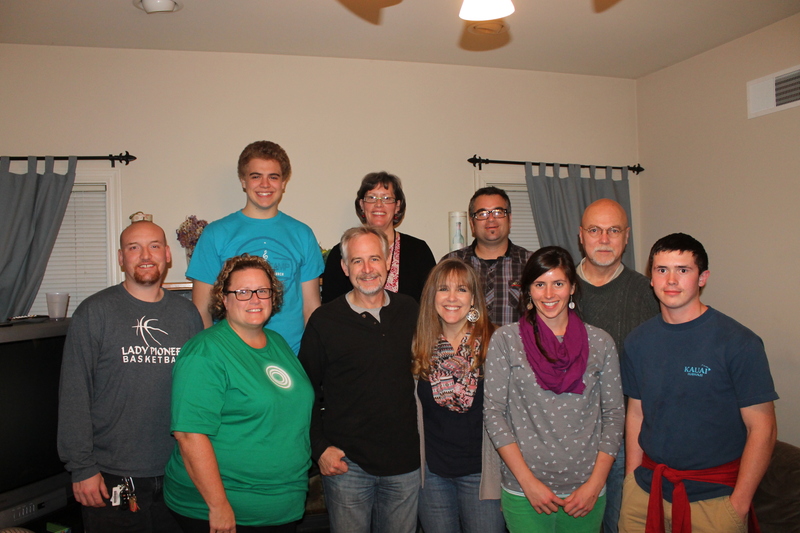 It was fun hearing some of their stories and about their ministry work. Someone asked us how we are doing with the busy schedule. To be honest, we are physically tired, but we are spiritually refreshed. 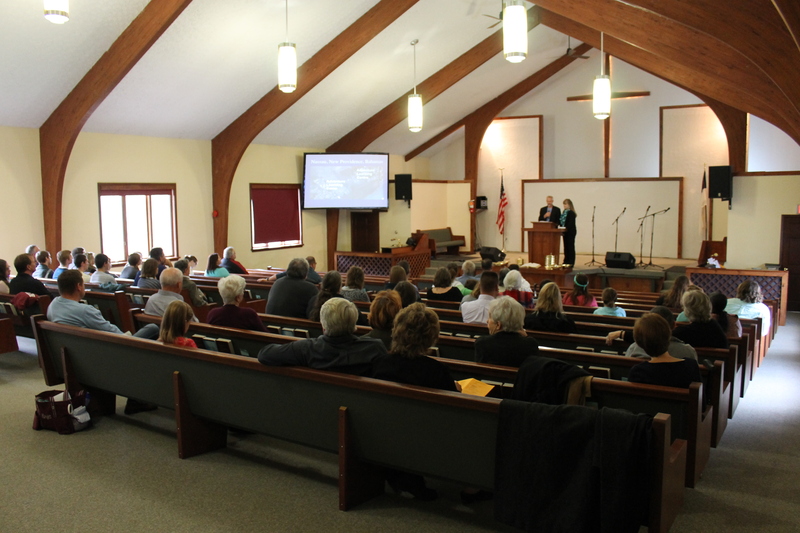 The pastor’s conference last week, our time this week at the Ministry Center and the care and concern from those in Wilson have done wonders to help refresh and renew us. Our next stop is Delhi, NY area. We will be there until Tuesday. We will try to provide another update next week. Have a great weekend!